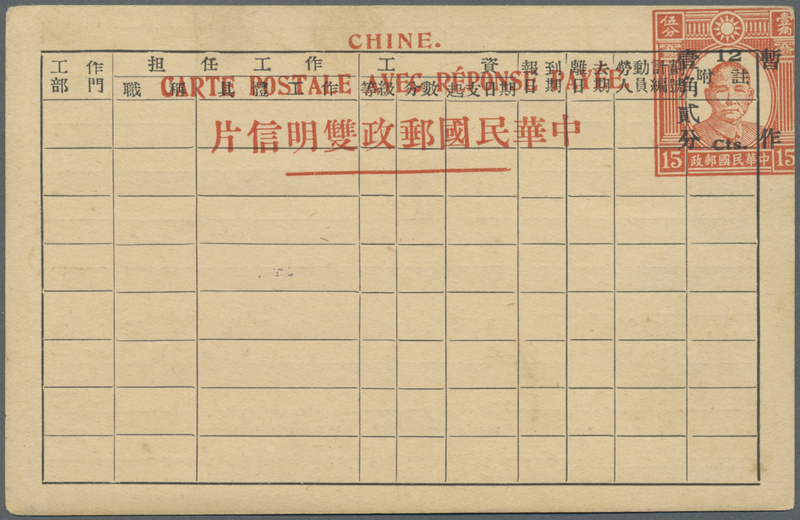 6593 Ganzsache (Complete) 1917/21, Chinese Labour Corps in France: official stationery reply envelopes (2, reverse sides only) used "NANSUICHANG 7.5.3" (May 3, 1918) or from "Chihli.an? 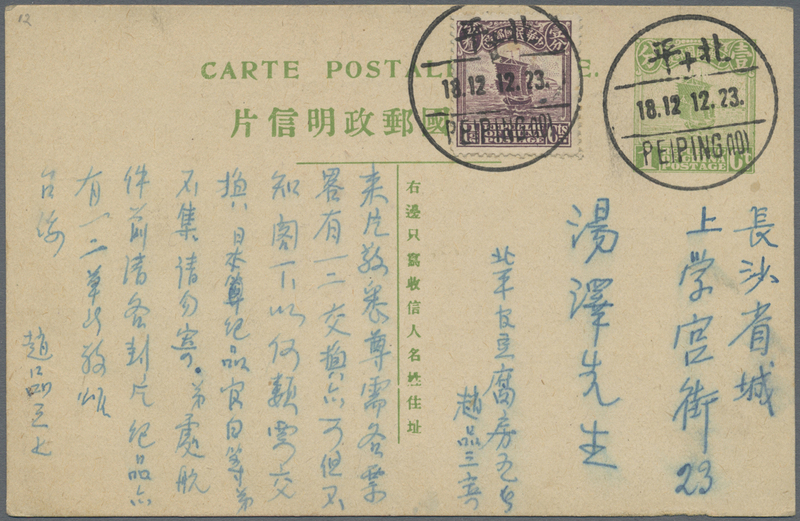 8.1.20" (Jan. 24, 1919) the latter with next day transit of "WEIHAIWEI". 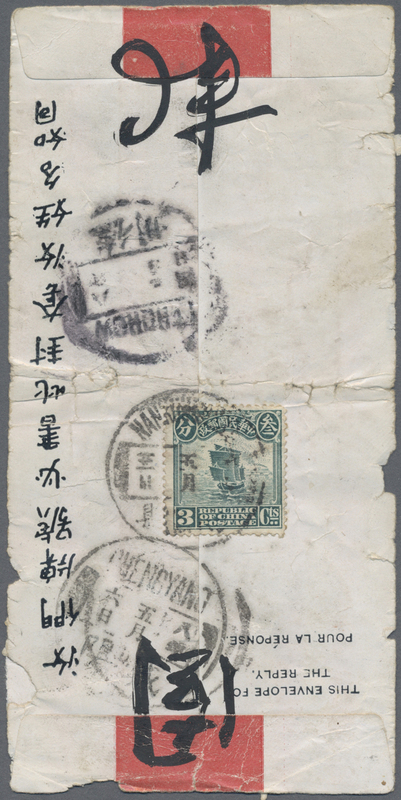 Plus two cover fronts used "TUNGCHWANFU 8.2.13" (Feb. 13, 1919) to "TSINGTAU 8.2.17", the chinese liaison at Tsingtao during japanese WWI-occupation. 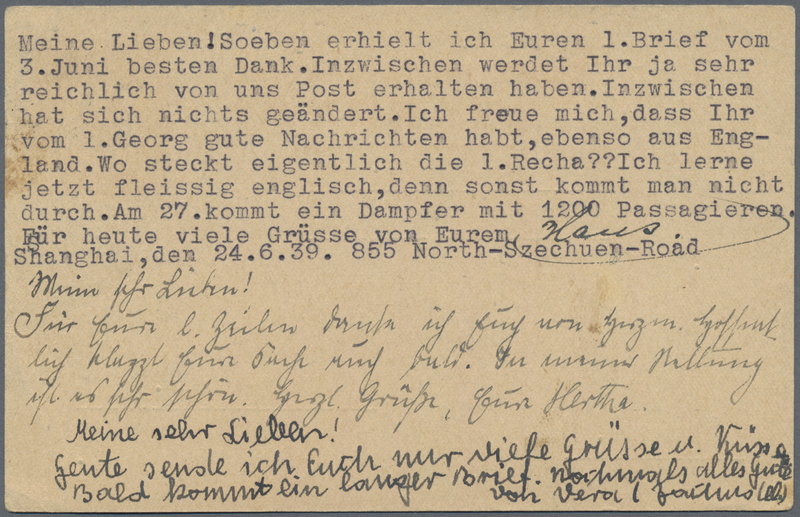 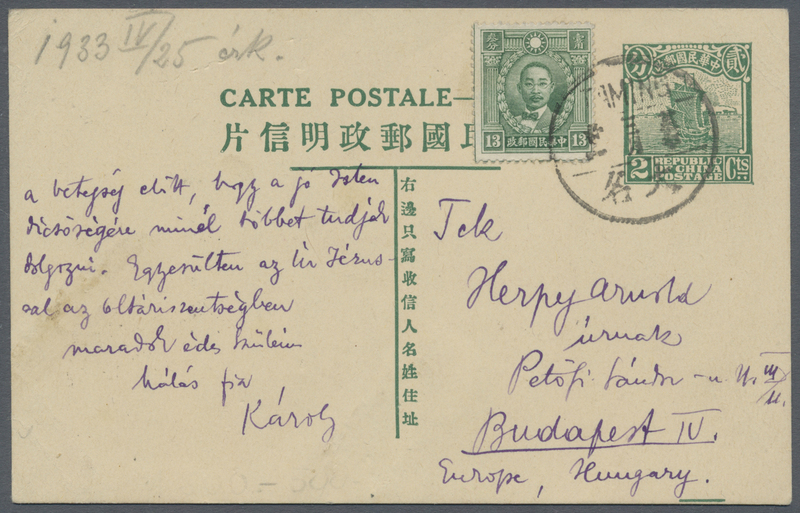 Also 1939 UPU card 15 C. "SHANGHAI 25.6.39" to Germany with message of three persons, Judaica. 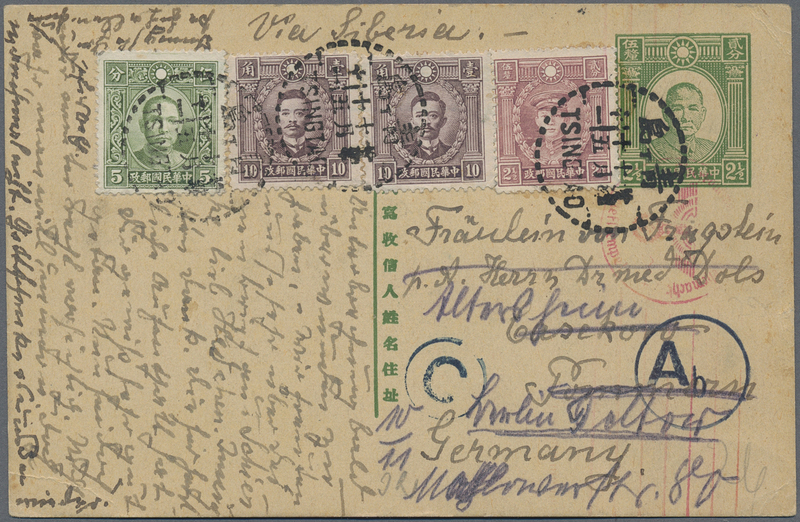 6598 Ganzsache (Complete) 1923/34, card junk 1 C. light green uprated junk 1 1/2 C. violet canc. 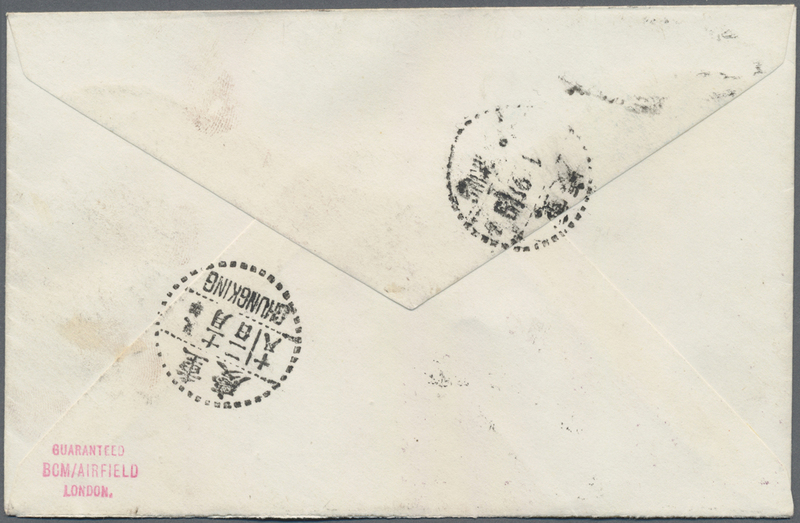 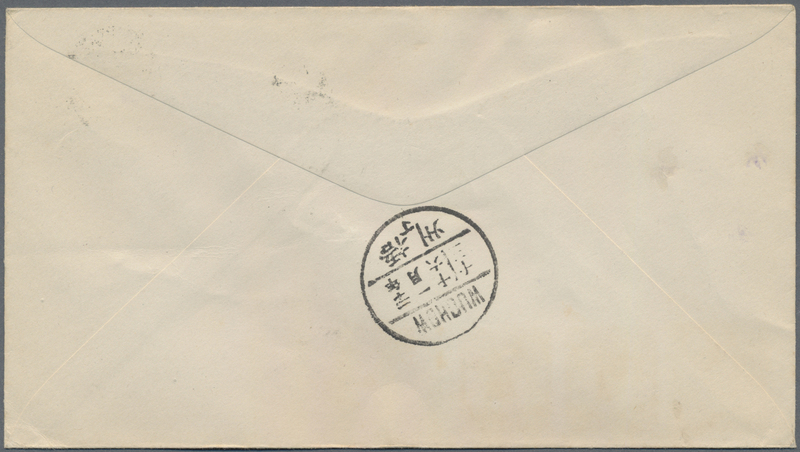 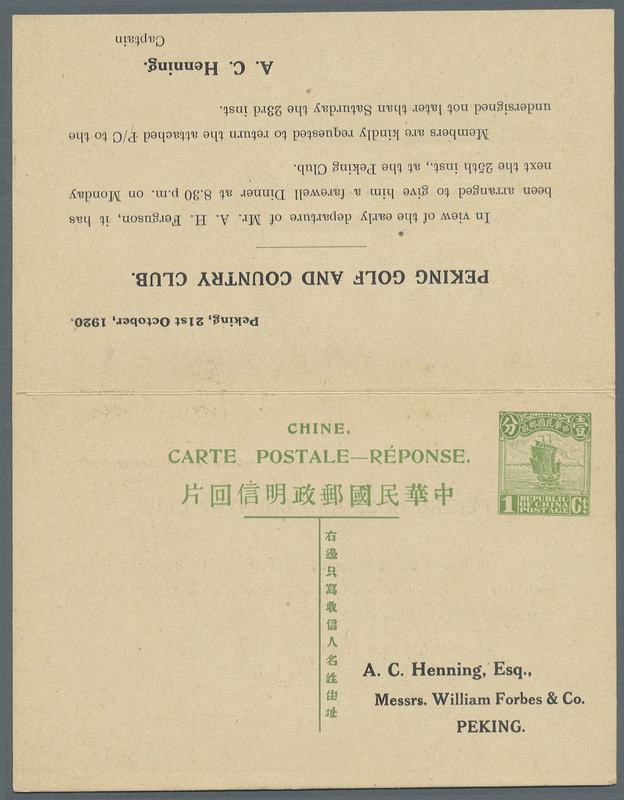 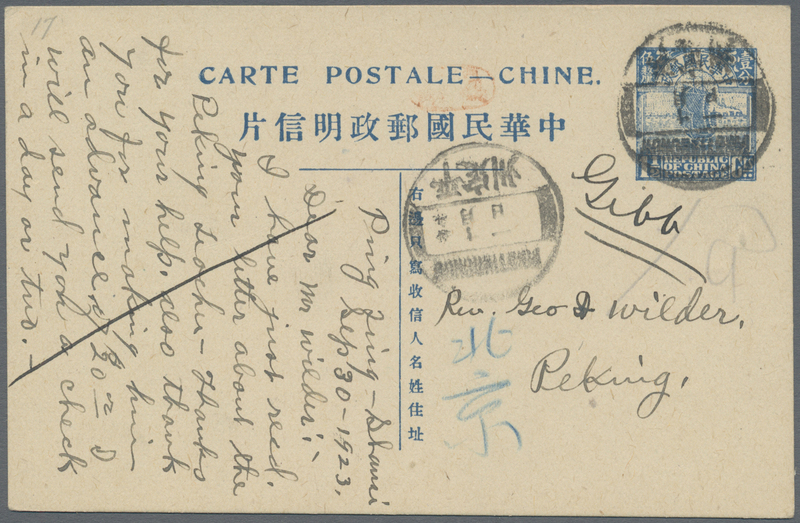 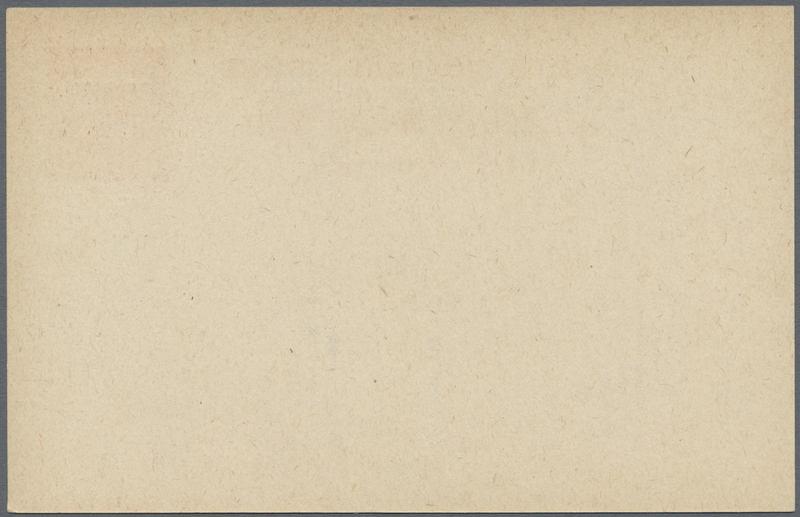 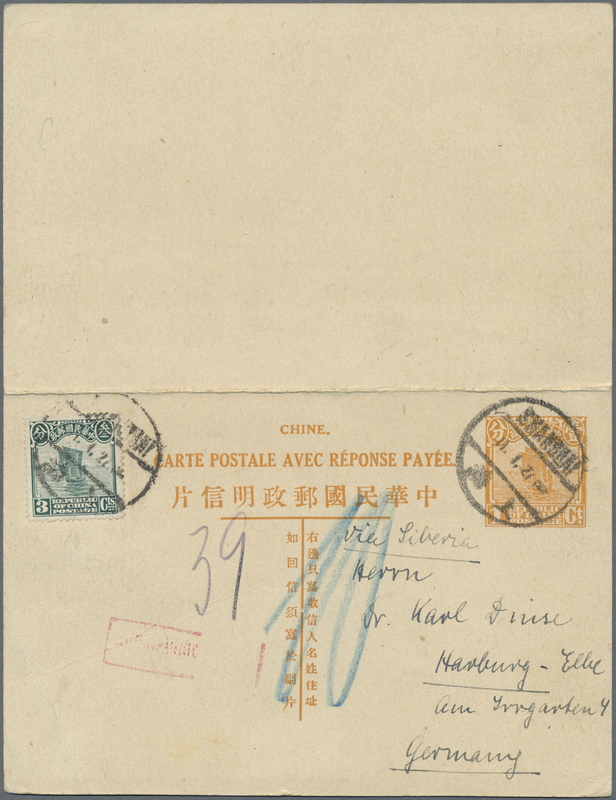 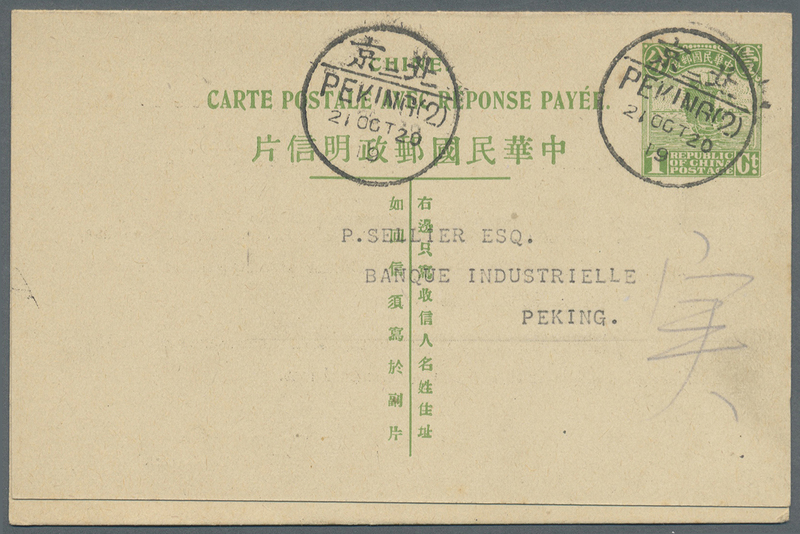 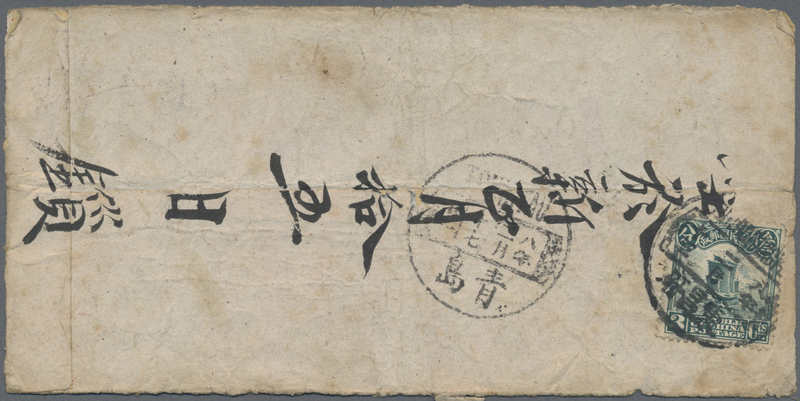 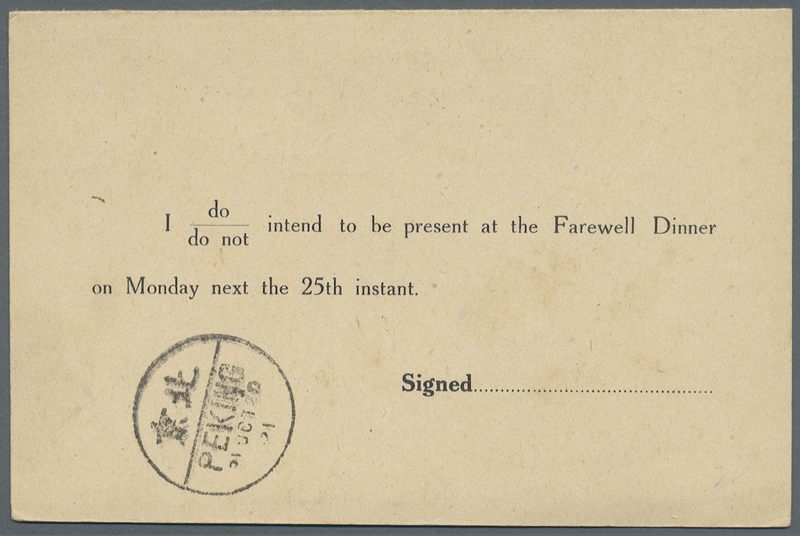 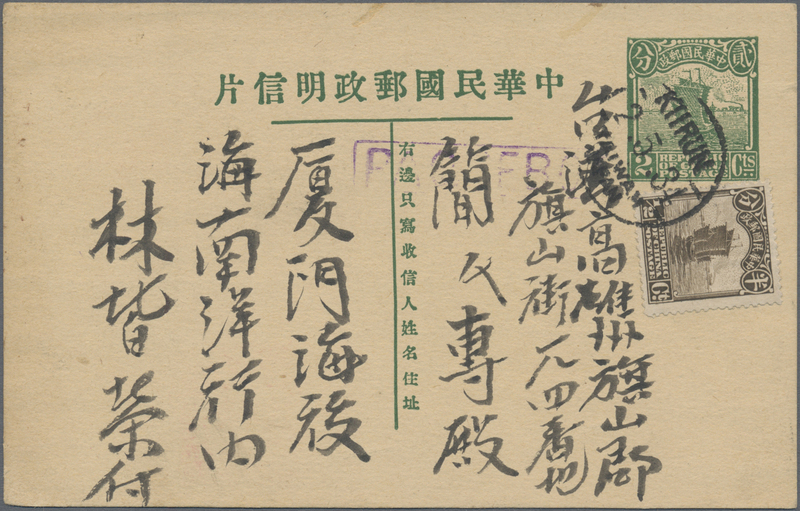 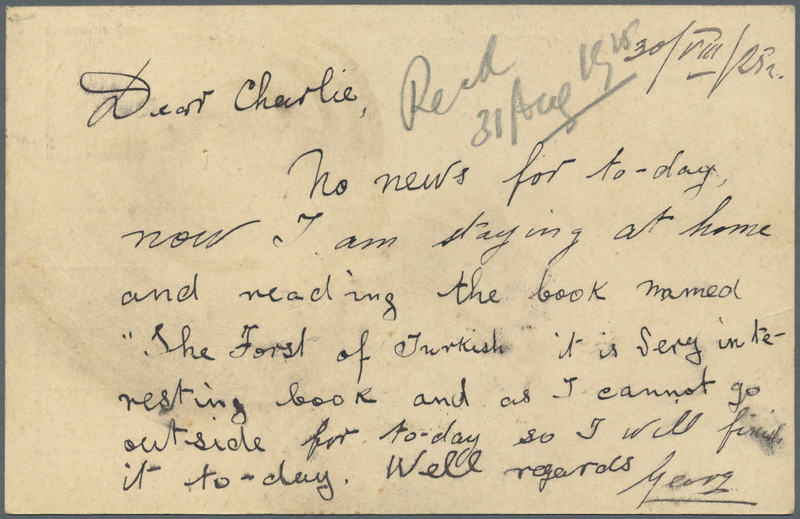 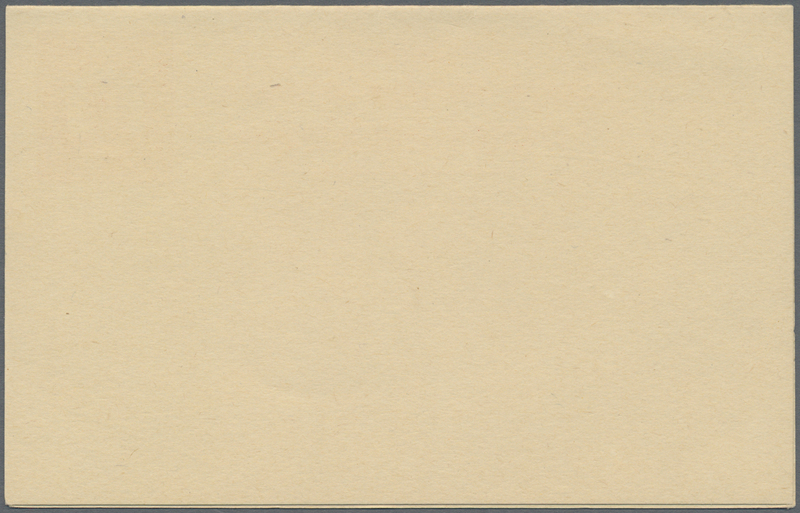 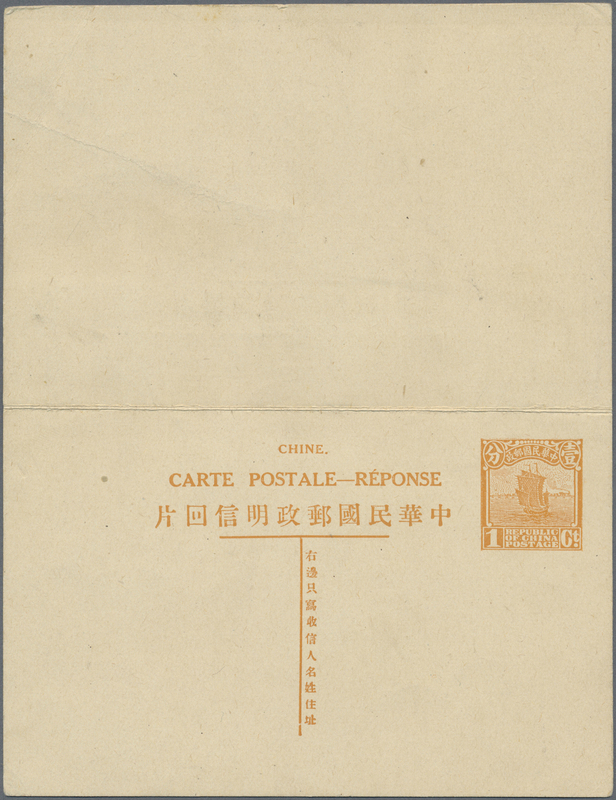 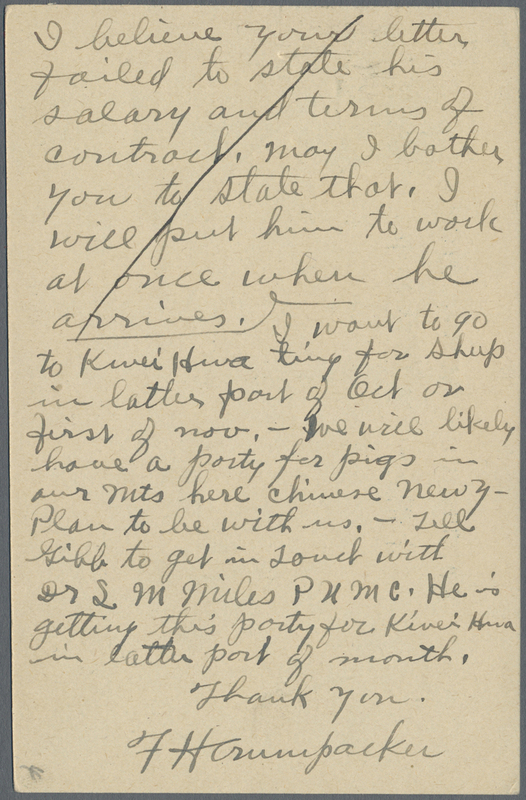 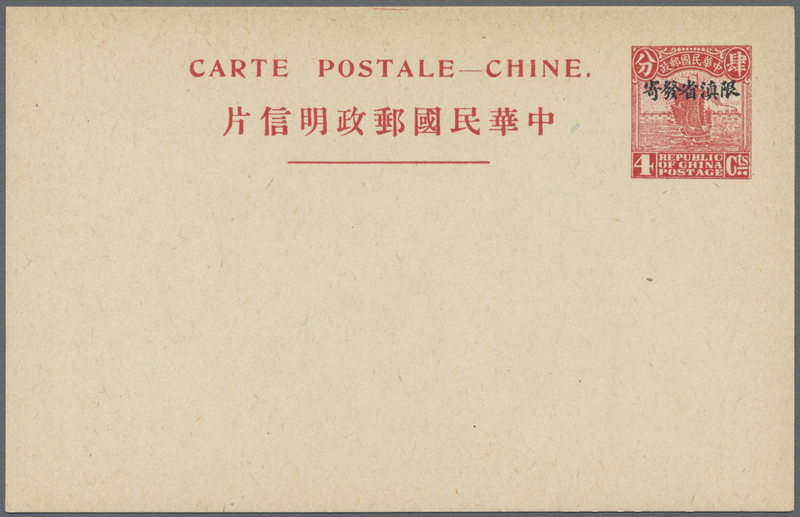 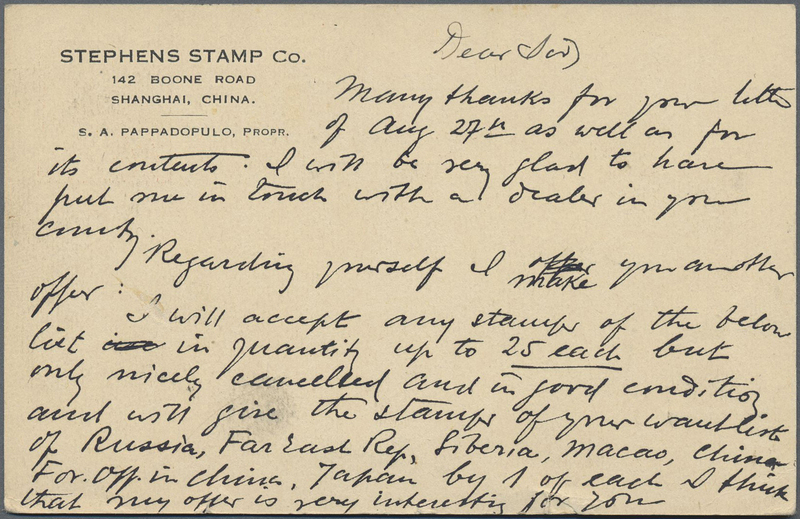 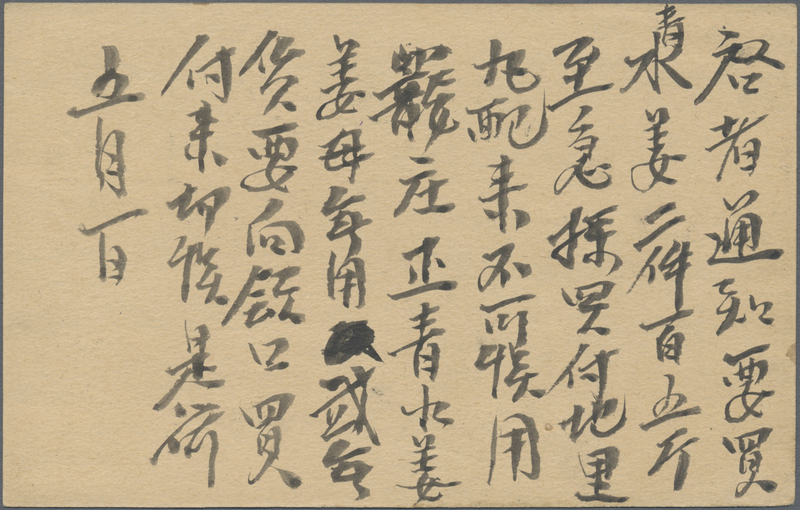 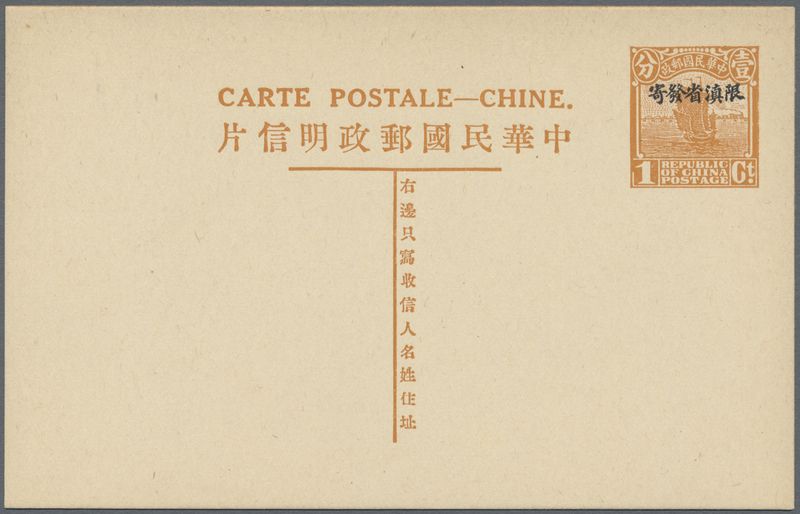 "PEIPING (10) 12.12.23" (Dec. 12, 1934) to Changsha; card junk 1 1/2 C. bue canc. 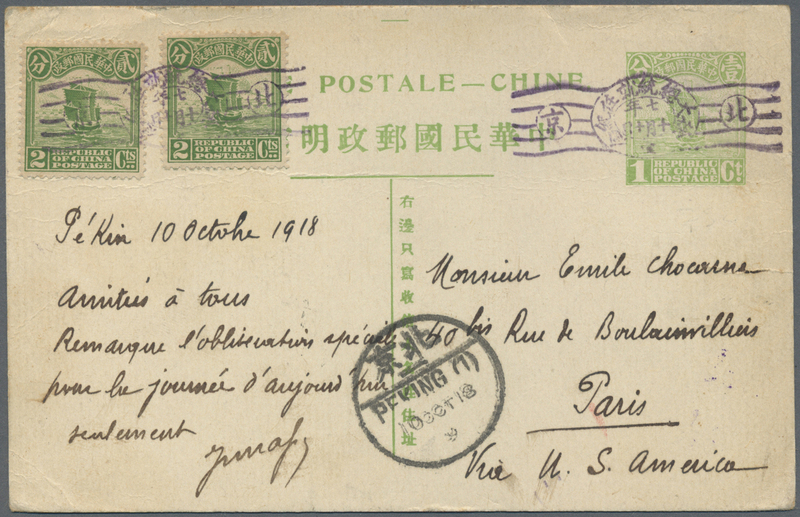 boxed bilingual "PINGTINGCHOW 12.10.1" (Oct. 1, 1923) to Peking. 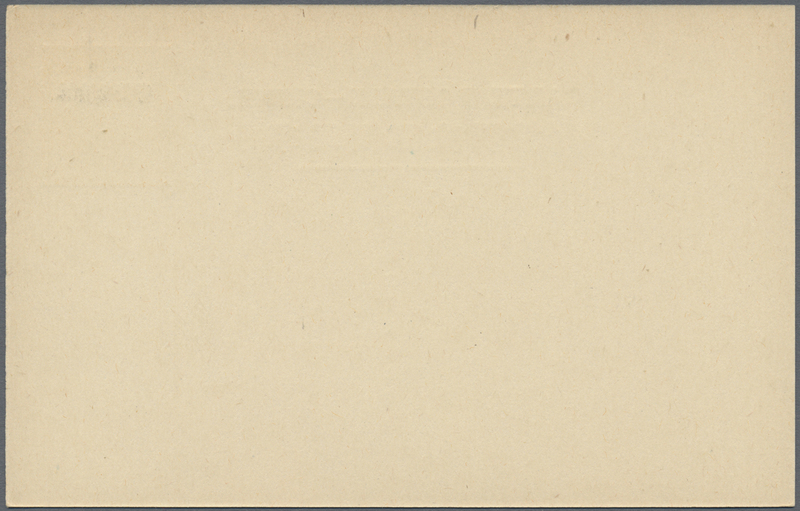 Two cards. 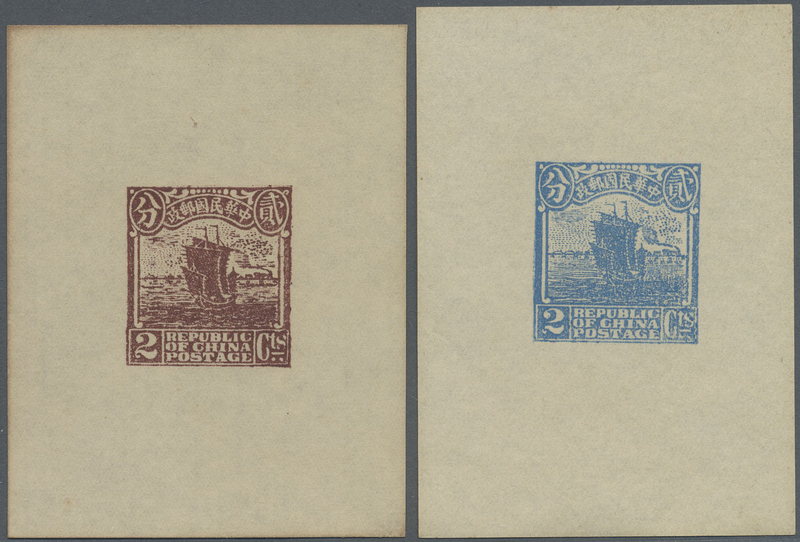 6601 Ganzsache (Complete) 1929, UPU card 6 C. carmine canc. 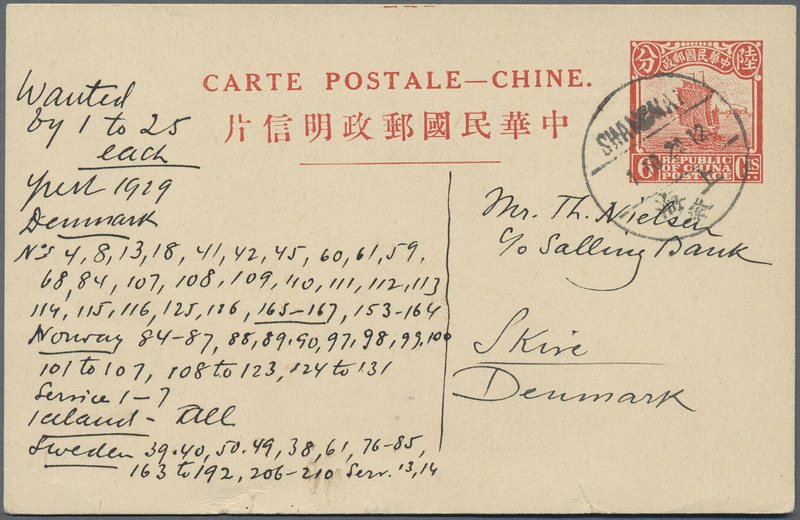 "SHANGHAI 1.12.29" to Skire/Denmark, bottom 3 mm tear. 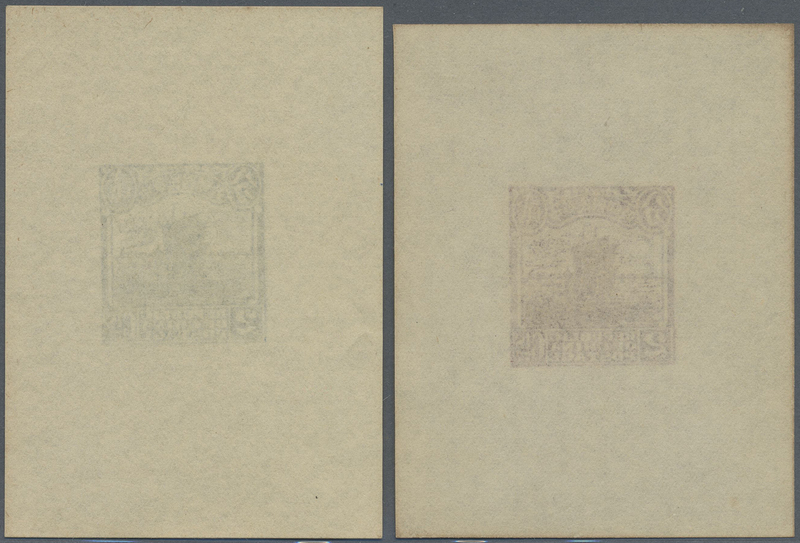 Sender stamp dealer S. A. Pappadopopulo. 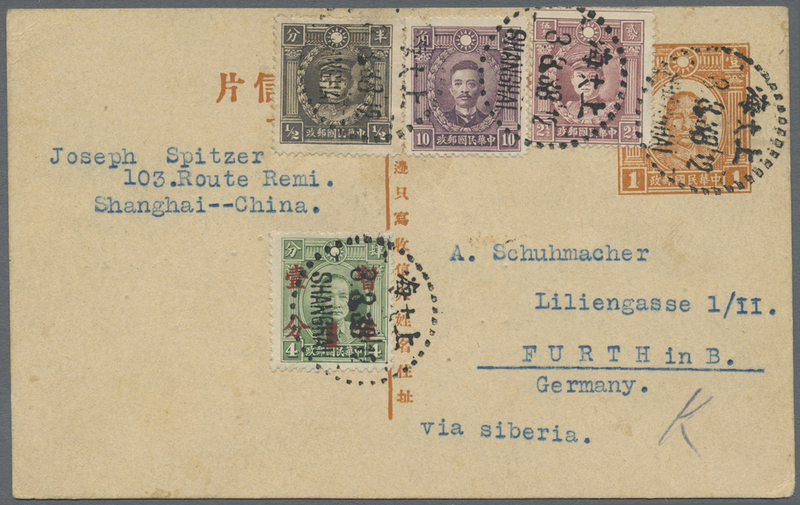 6603 Ganzsache (Complete) 1930, card junk 2 C. uprated 1/2 C. tied "KIIRUN TAIWAN NIPPON 2.5.34" with violet boxed "PAQUEBOT" alongside, from Amoy/China to Kaohsiung (Takao)/Taiwan. 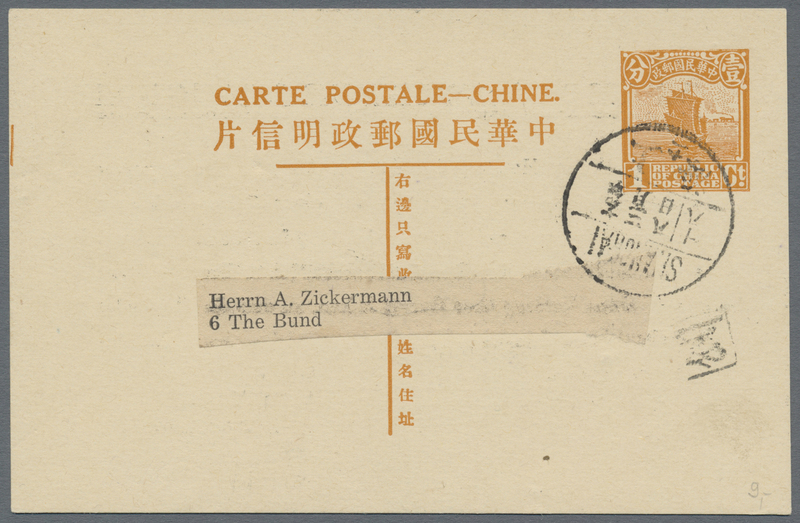 6607 Ganzsache (Complete) Han 41 1935, SYS UPU card 12 C./15 Ct. double card, unused mint. 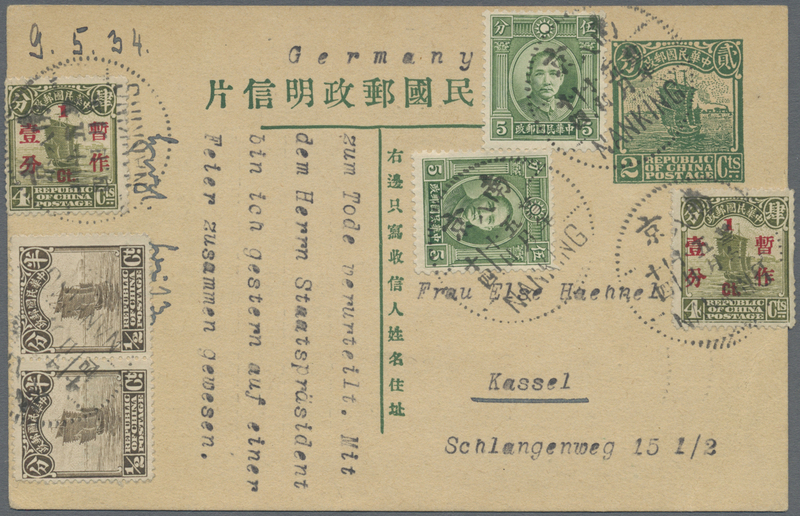 6608 Ganzsache (Complete) Han 43 etc 1935, SYS 2 1/2 C. green uprated martyrs 8 C./40 C., 20 C., 30 C. for airmail foreign canc. 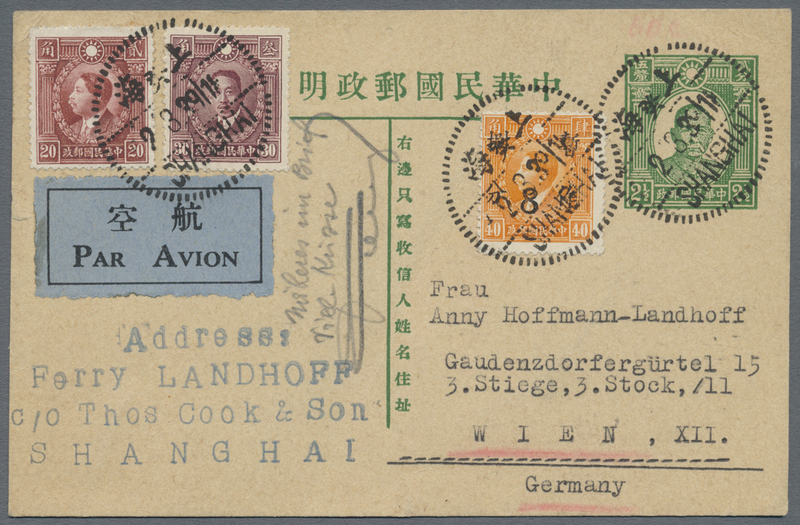 "SHANGHAI 2.3.39" to Vienna/Germany, card crease. 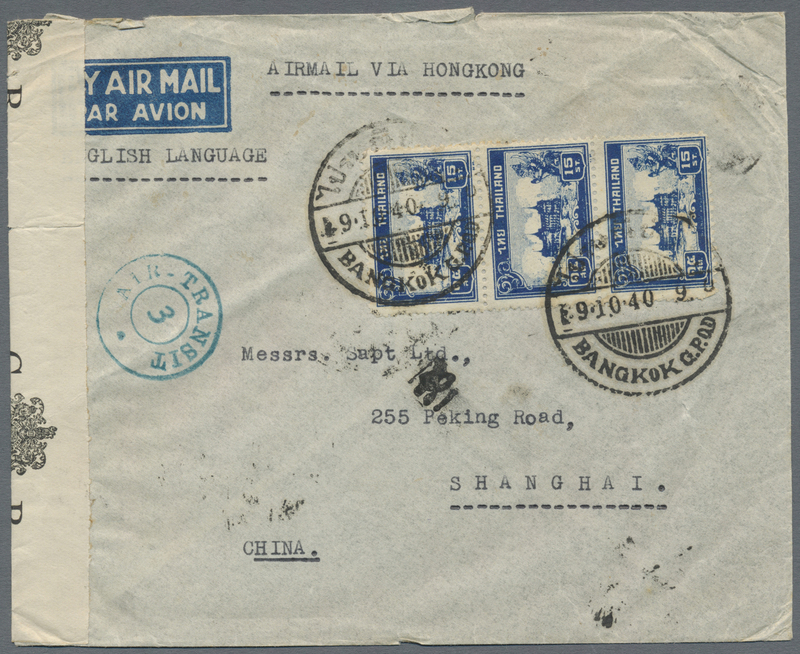 Unusual handling by airmail. 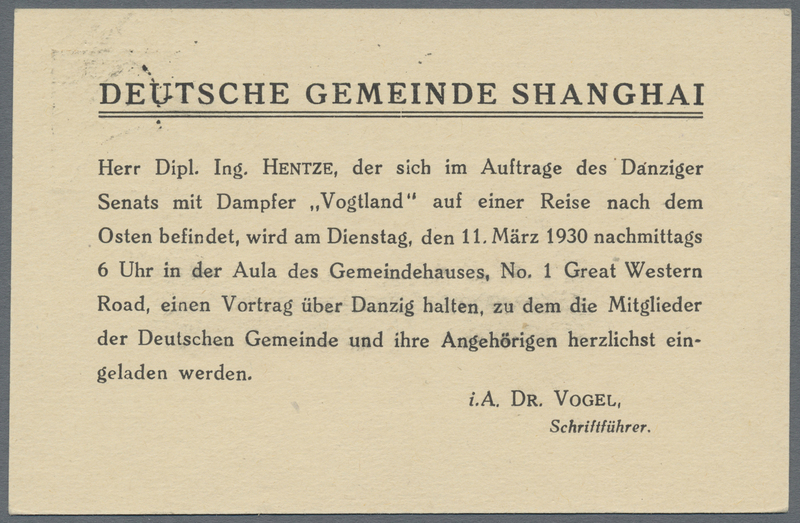 6610 Ganzsache (Complete) 1940, UPU card SYS 15 C. uprated same canc. 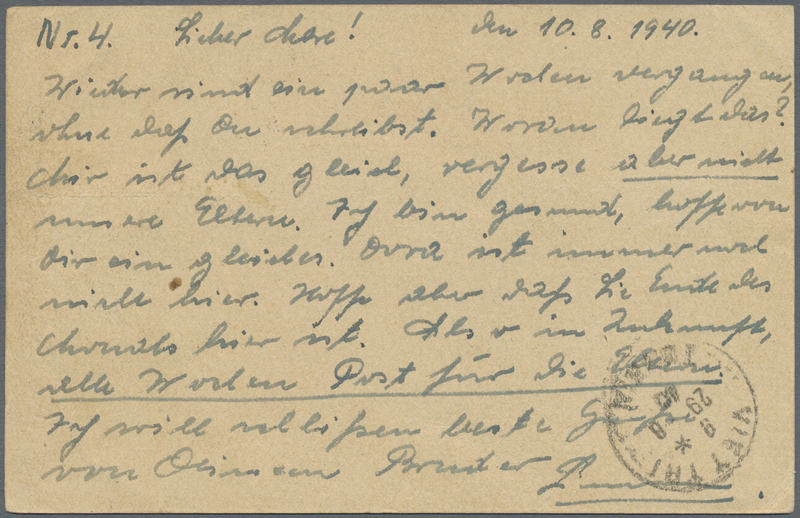 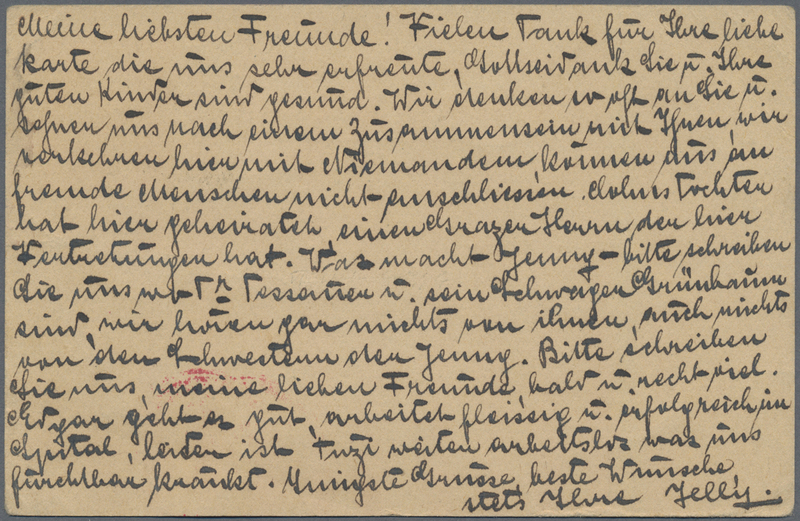 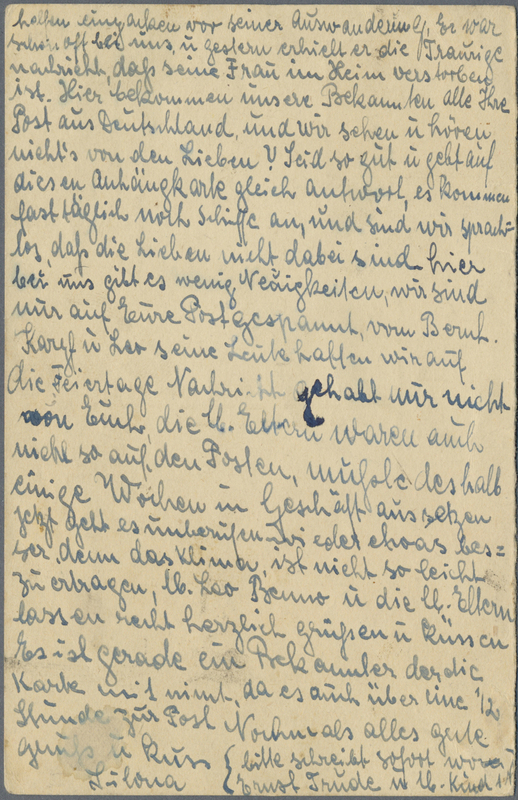 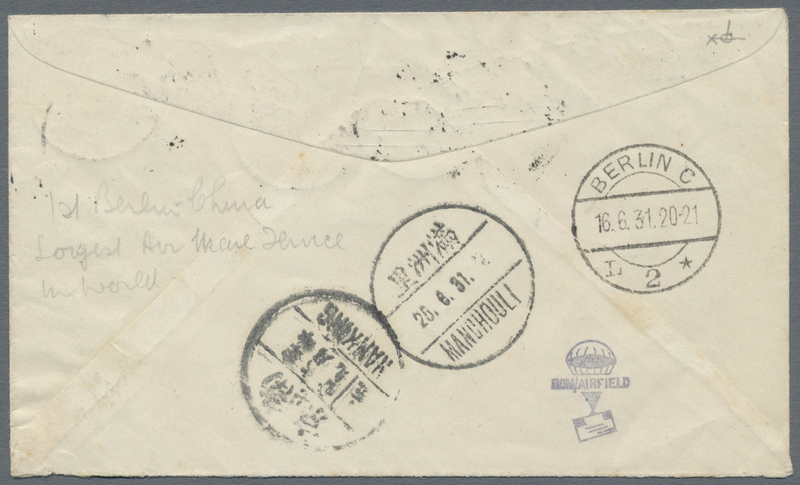 "SHANGHAI 11.2.40" to Vienna/Germany, Judaica. 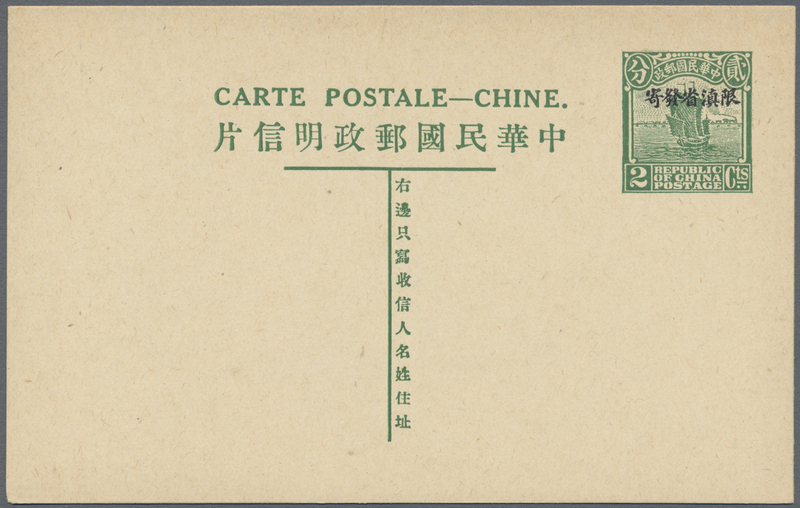 6612 Ganzsache (Complete) 1940, Chinese postal stationery card 2 1/2 c green upgraded with SG 398, 5c green, SG 412, 2 1/2c claret and SG 415, 10c purple (pair) tied by Tsingtao date stamp addressed to Germany endorsed 'via Siberia' with German censor cachet in red and circular 'Ab' on face. 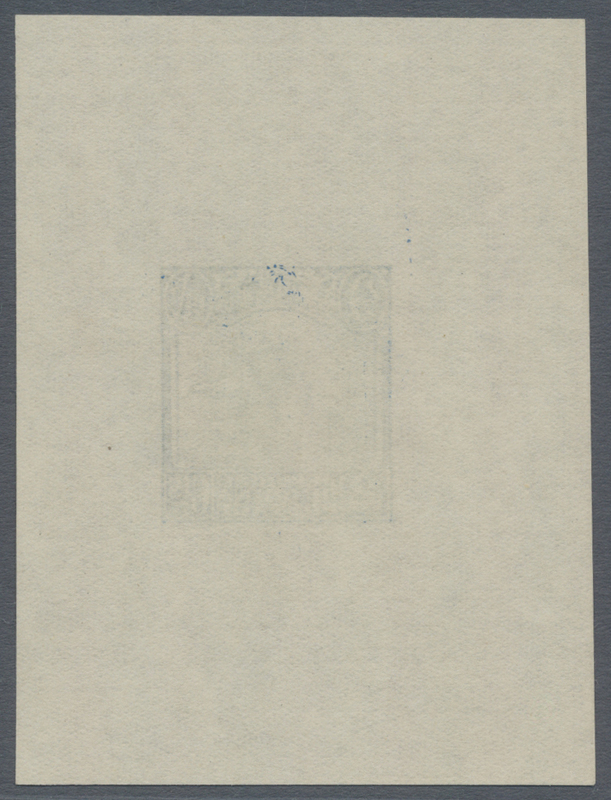 Nice item! 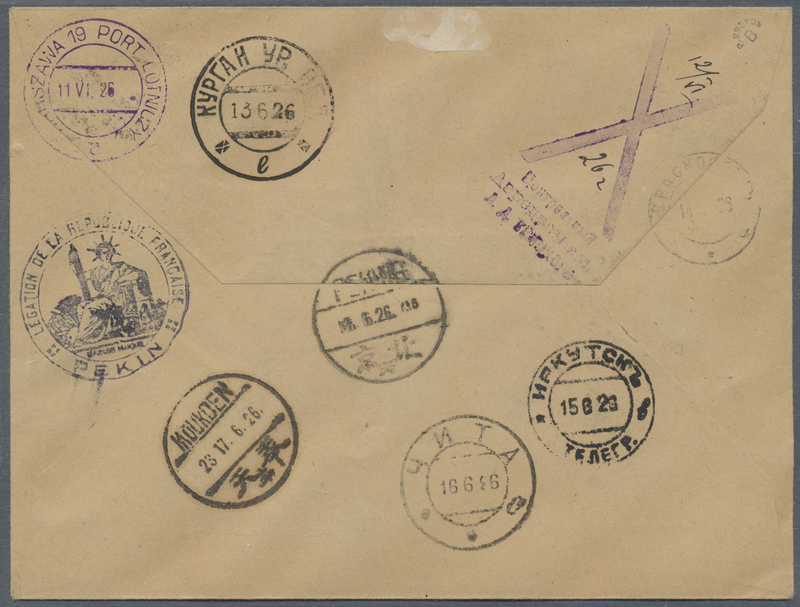 6614 Ganzsache (Complete) 1940 (ca.). 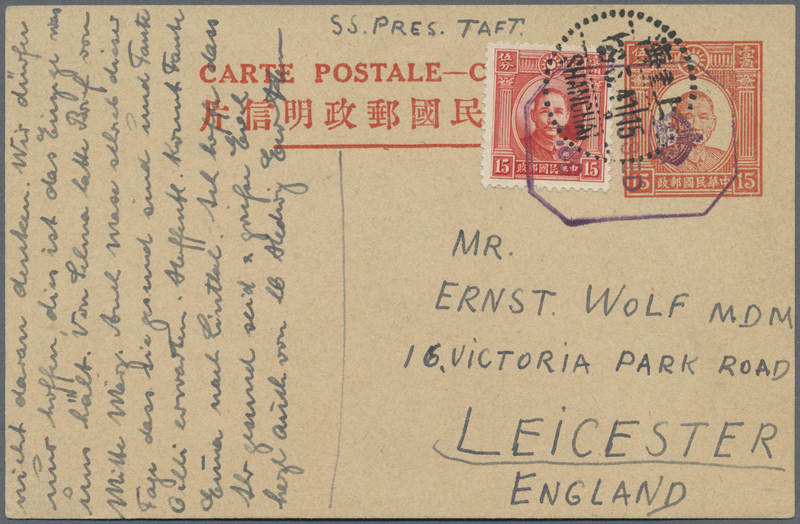 Postal stationery 'Reponse' 'Sun Yat-Sen' 12c on 15c orange for Provincial usage. 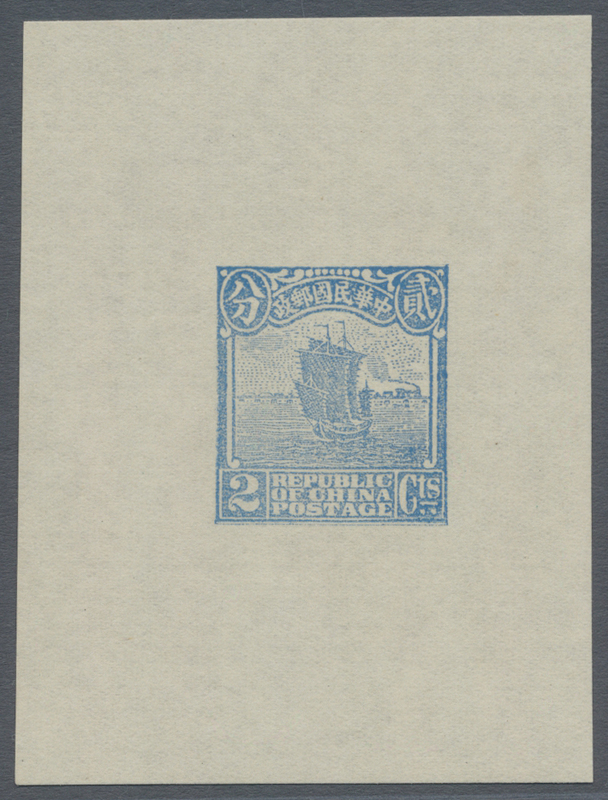 6615 Ganzsache (Complete) 1940 (ca.). 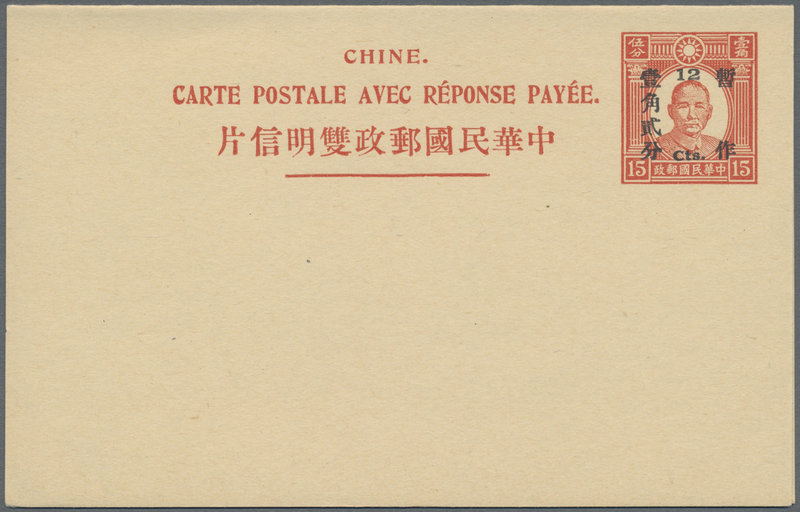 Postal stationery 'Reponse Paye' 'Sun Yat-Sen' 12c on 15c orange for Provincial usage. 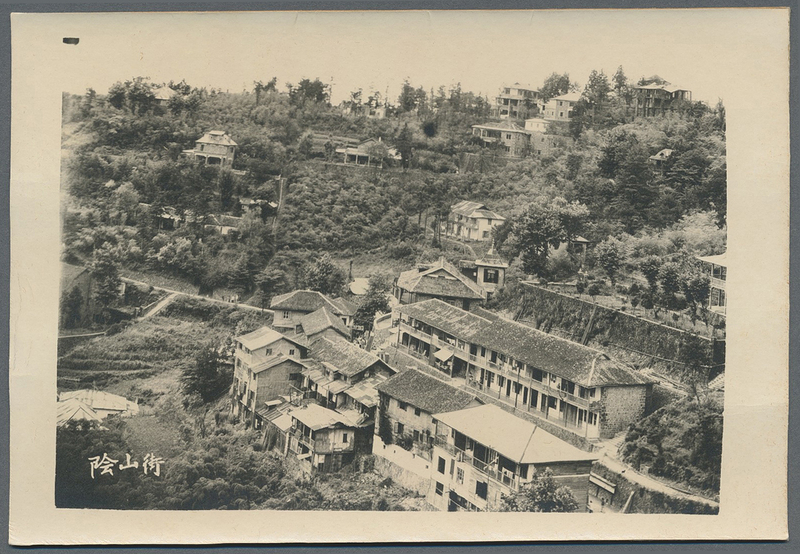 6616 Ganzsache (Complete) P 1945 ca., 10 $ green Sun Yat-sen, mint stationery card with mounted b/w real-photo of a chinese village. 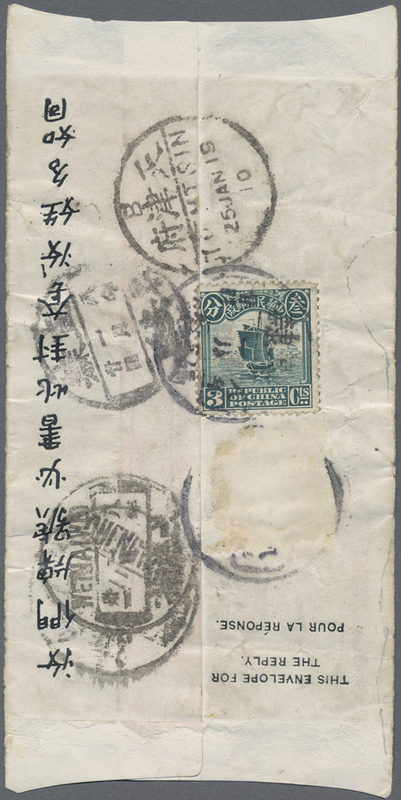 6617 Ganzsache (Complete) 800, 859, 864 (2) 1948, plum blossoms $50.000 with ovpts. 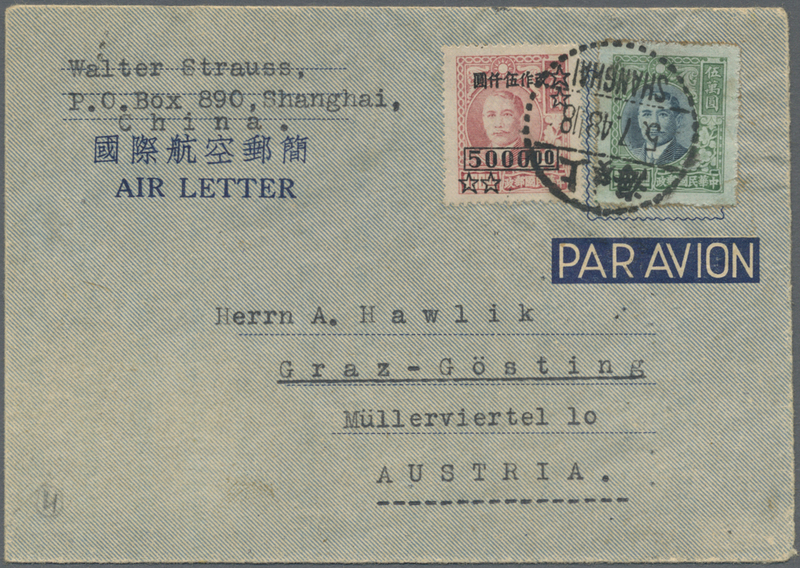 $10.000/$20 (3), $5.000/$100 for a $85.000 frank tied "SHANGHAI 5.7.48" to official airletter form "Price: $5.000" to Graz/Austria, long message, commercial usage. 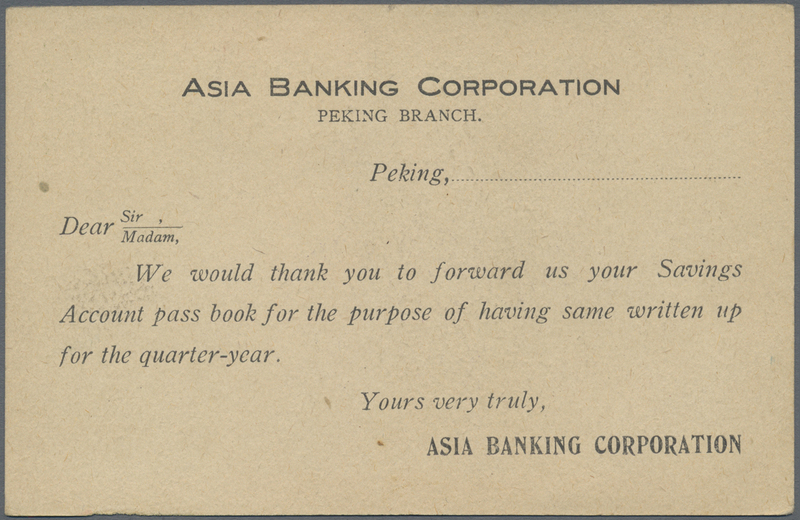 6618 A 802, 851, 852 1948, plum blossoms $200.000 with airmails $30.000/90 C. and $20.000/25 C. for a $250.000 frank tied "PEIPING 11.8.48" to official airletter form "Price: $5.000" to Budapest/Hungary w. Aug. 21/22 backstamps, two inner pages missing, commercial usage. 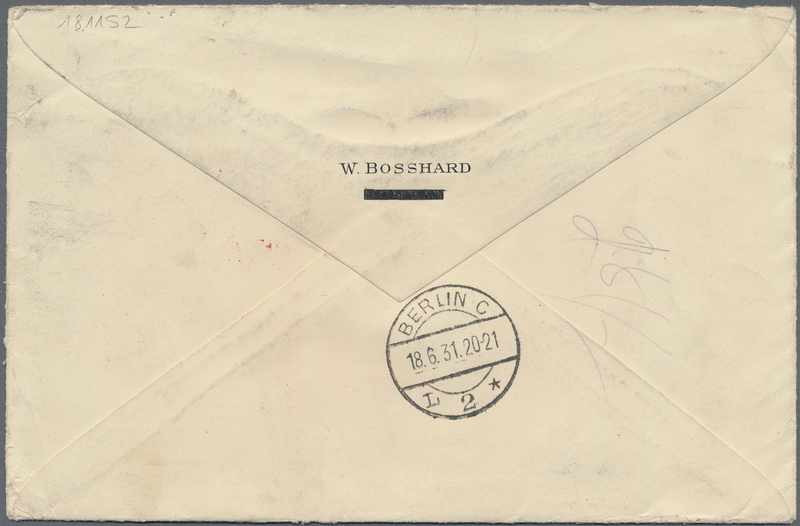 6619 Ganzsache (Complete) 923 (3) etc. 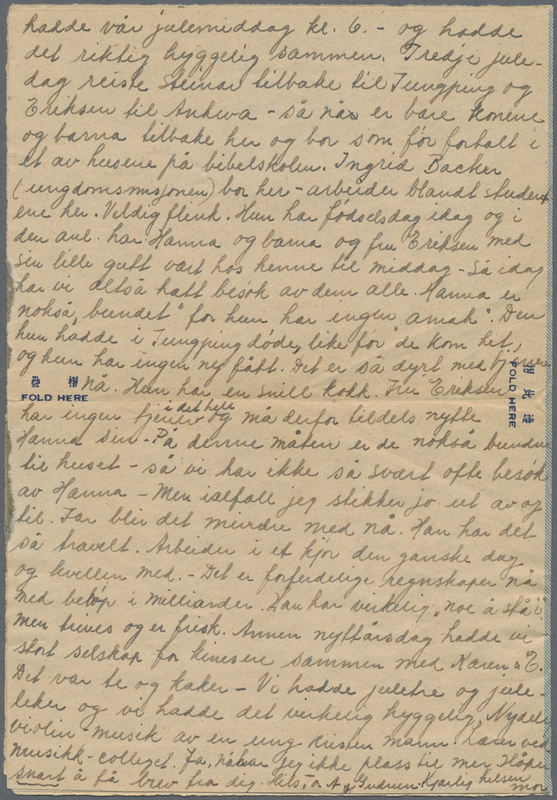 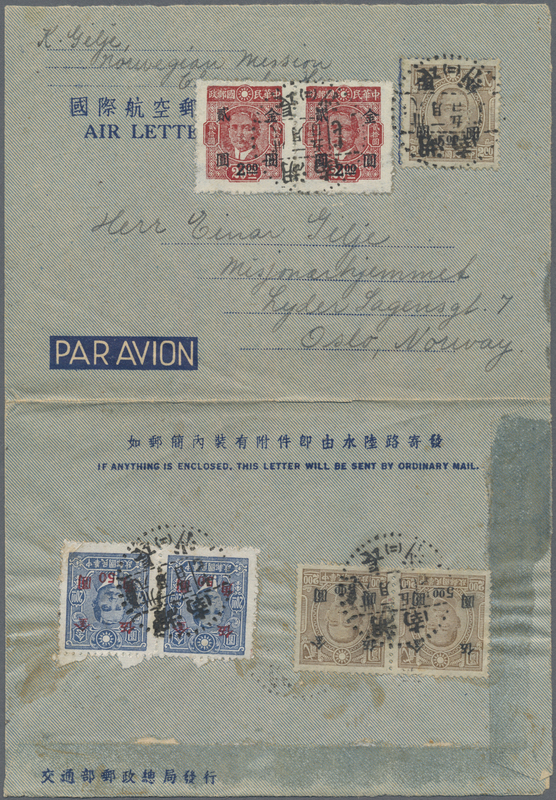 1948, gold yuan stamps at the fixed rate of $20 tied "CHANGSHA 5.1.38" (Jan. 5, 1949) to official airletter form to Oslo/Norway, all pages filled with message in norvegian. 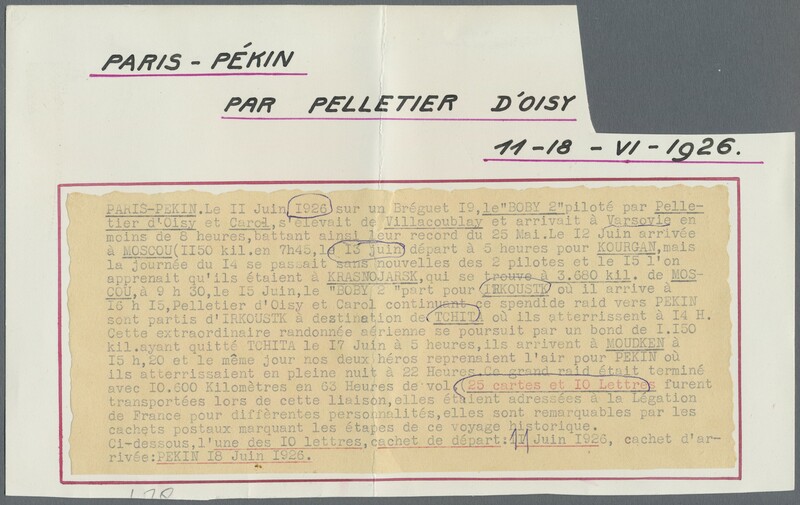 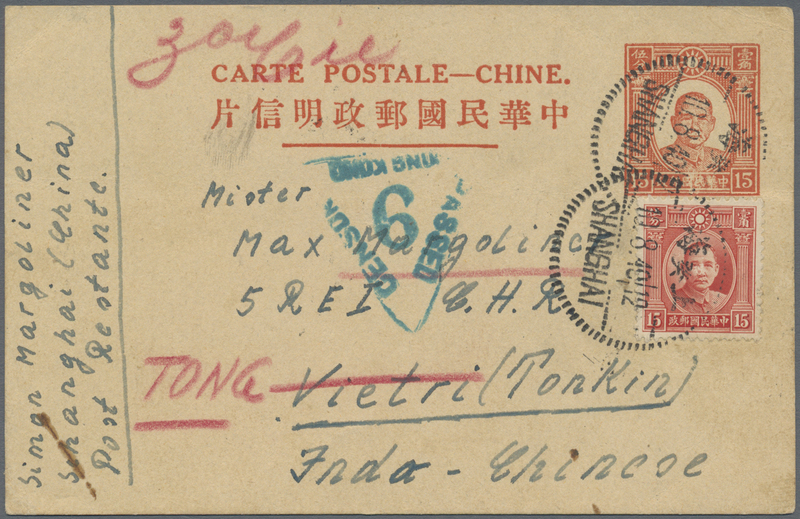 6621 Flugpostbrief (Flight cover) 1926, pioneer flight Paris-Peking by Pelletier-D'Oisy, started Pairs 1926.6.11 and arrived Peking June 17. 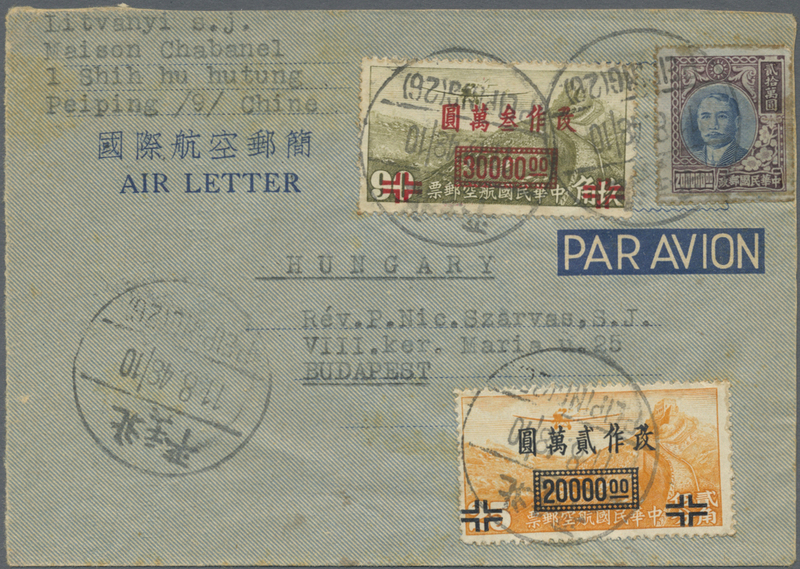 It was a record flight of 63 hours for 10.600 km via Siberia. 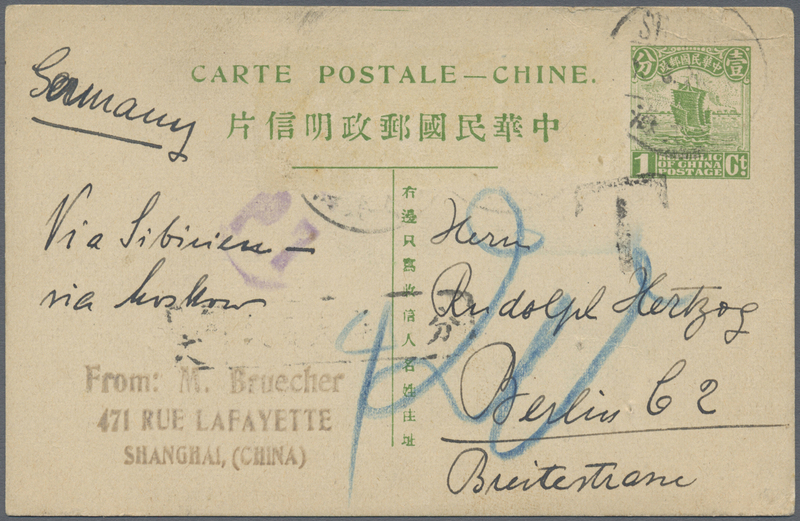 Boxed "BREGUET" company dater, on reverse 9 transit marks of Poland, Russia, "MOUKDEN 17.6.26" and arrival "PEKING 18.6.26", also entry marking of French embassy. 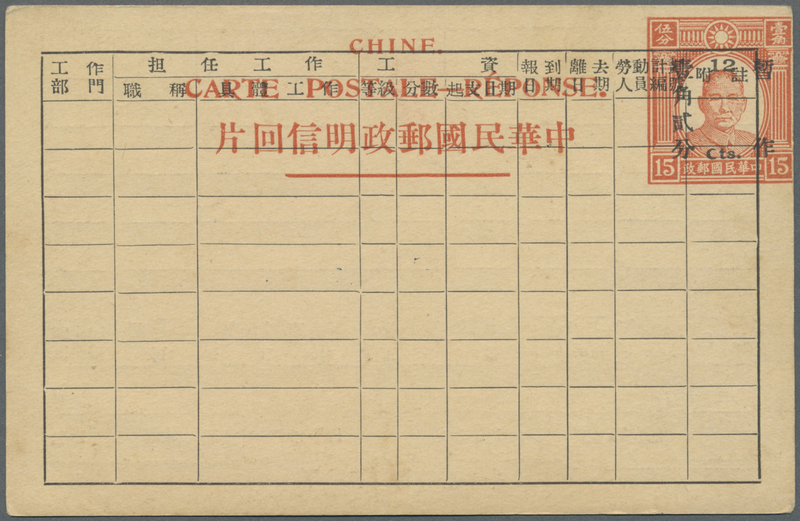 Only 10 covers and 25 cards were transported. 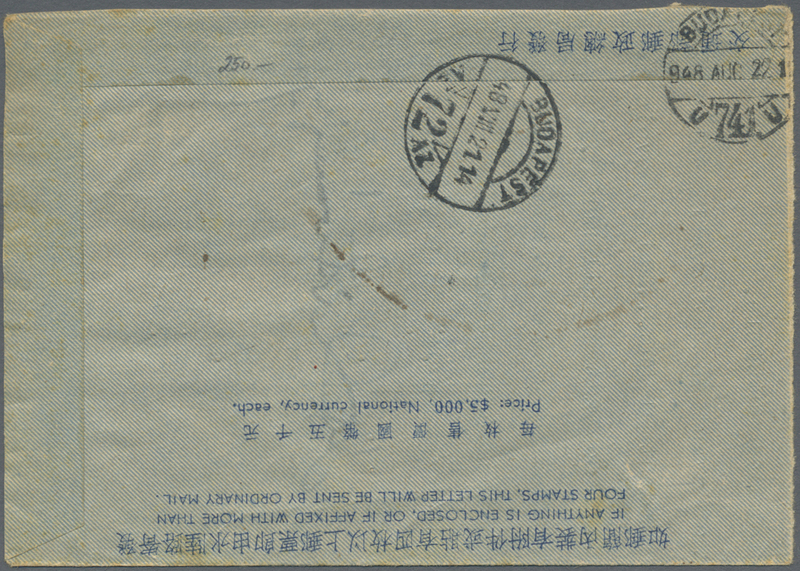 This one of the 10 covers, a historic document. 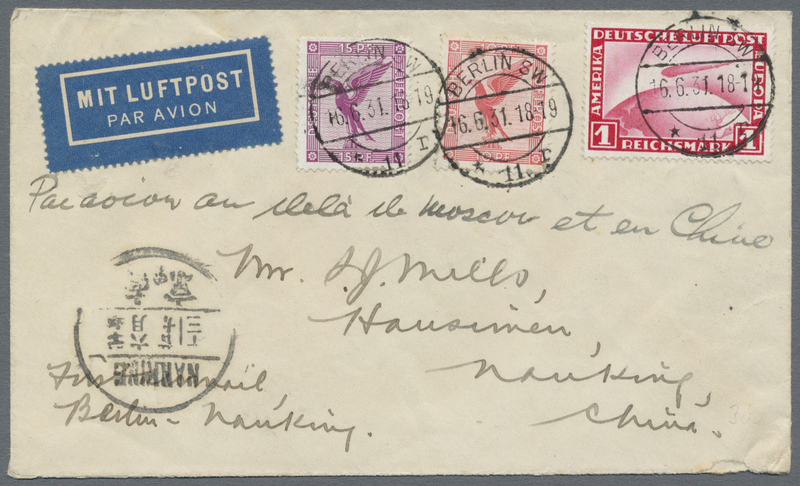 6622 Brief (cover) 1931, air mail 30 C., hall of classics $1 (3) etc. 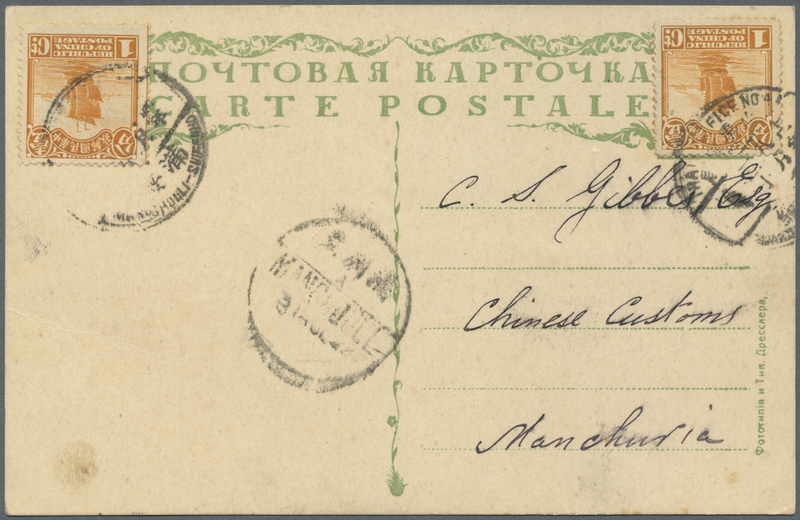 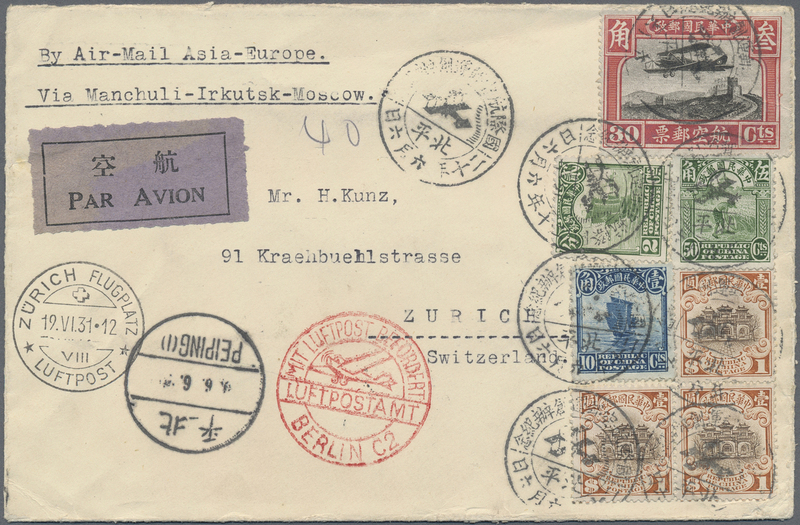 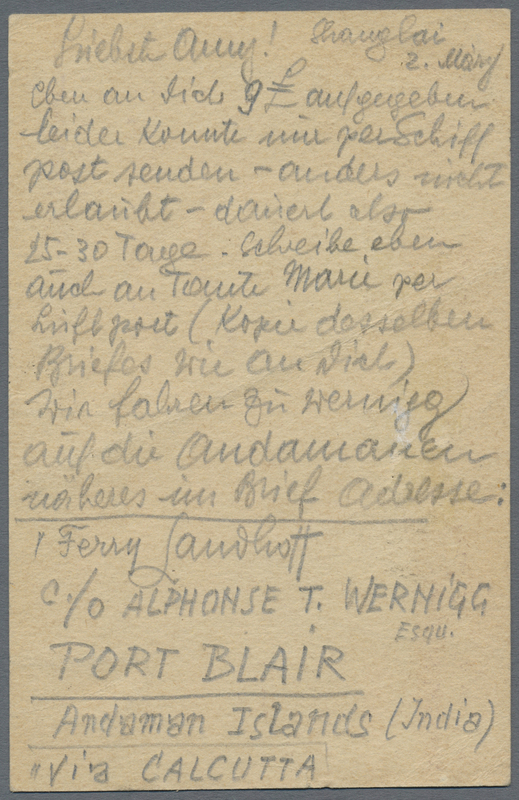 $3.92 air mail frank tied "Peiping 20.6.6/Opening of international airmail" special pictorial marking to air mail cover endorsed "Asia-Europe, via Manchuli-Irkutsk-Moscow" to Zurich/Switzerland, red Berlin AP transit (June 18 dater on reverse), "ZÜRICH FLUGPLATZ 19.VI.31" arrival. 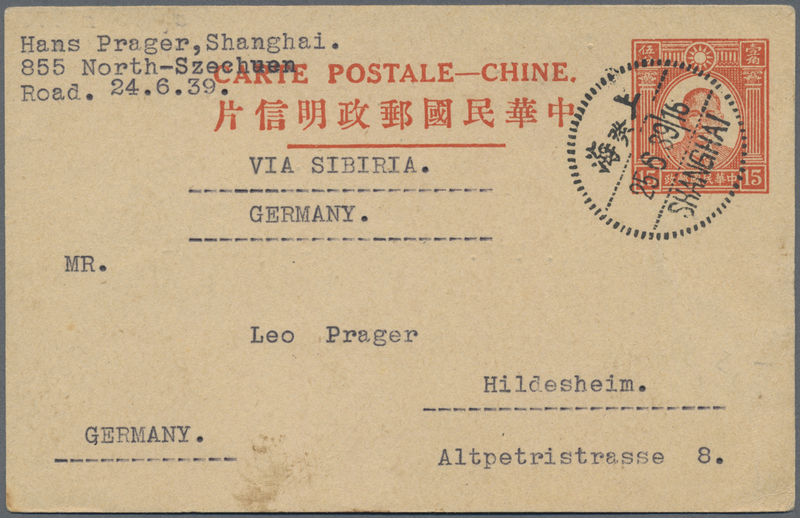 6623 Flugpostbrief (Flight cover) 1931, Eurasia, FFC China Berlin w. on reverse total $2.20 franking tied six strikes of pictorial LCD "Shanghai 20.5.31" to reverse of official Eurasia envelope, Berlin AP red confirmation hs and June 11 Berlin delivery dater, some toning. 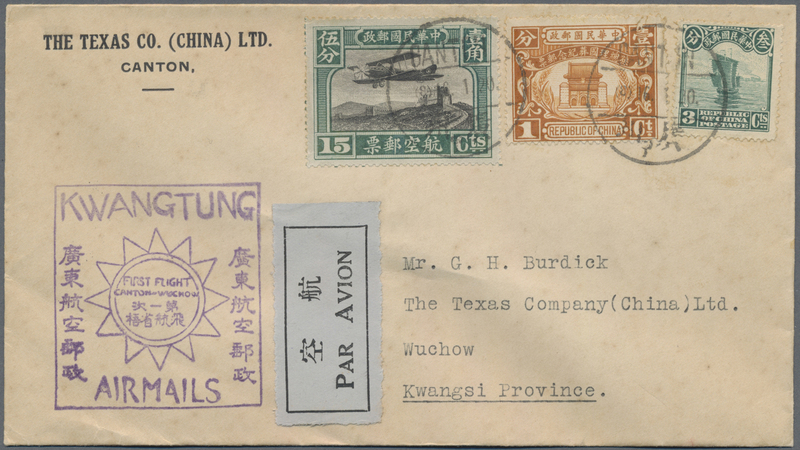 6624 Brief (cover) 1931, FFC Canton-Wuchow, boxed violet cachet "KWANGTUNG/AIRMAILS" with 19 C. franking tied "CANTON 16.1.20" (Jan. 16, 1931) to Wuchow w. same day arrival on reverse. 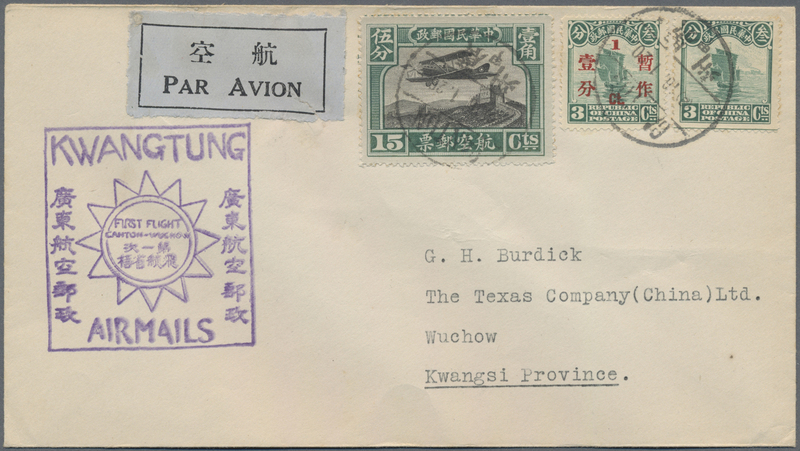 6625 Flugpostbrief (Flight cover) 1931, FFC Canton-Wuchow w. boxed violet cachet "KWANGTUNG/AIRMAILS" with 19 C. franking tied "CANTON 16.1.20" (Jan. 16, 1931) to Wuchow (backstamp). 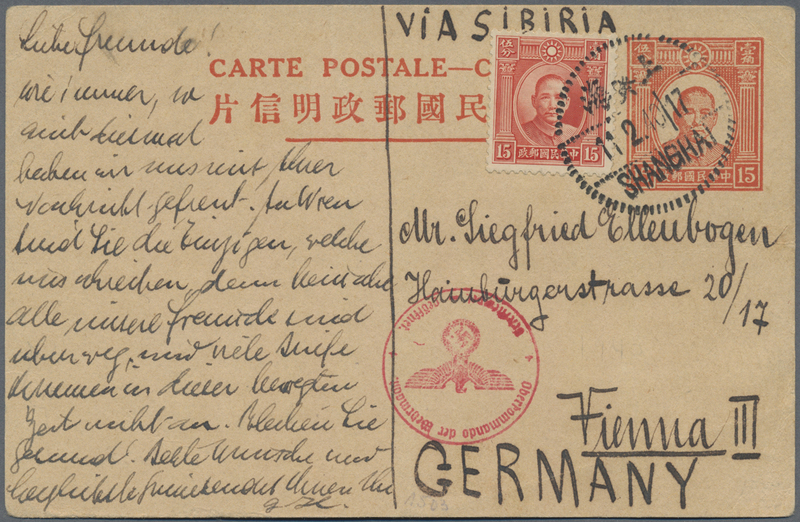 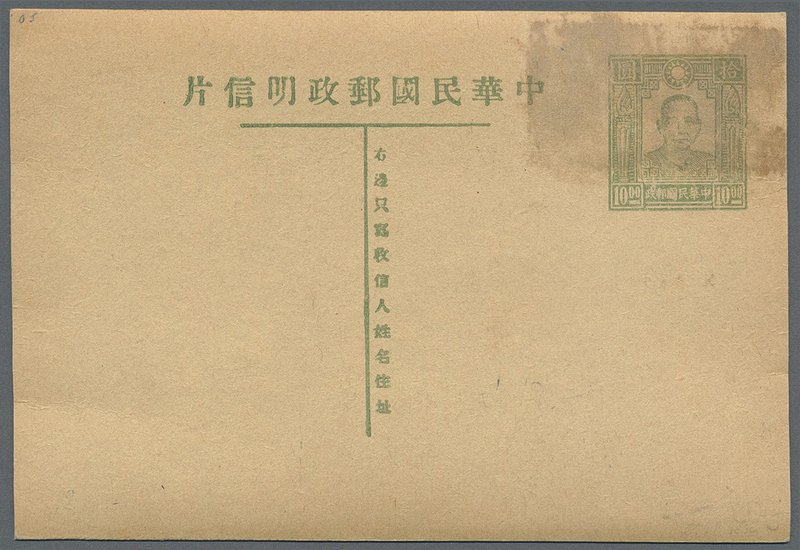 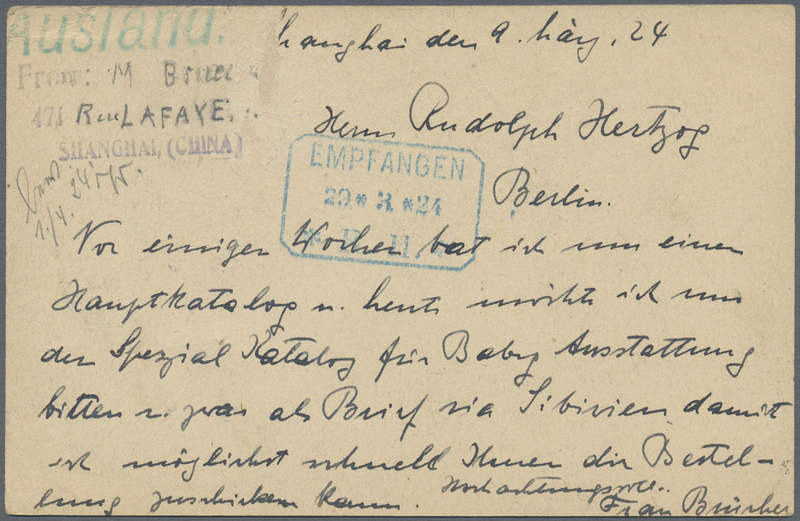 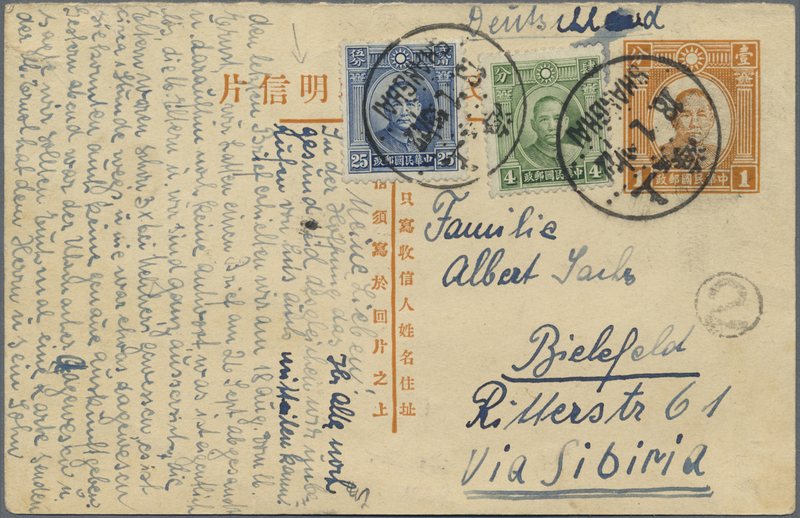 6626 Flugpostbrief (Flight cover) 1931, FFC Eurasia Germany-China via Siberia, total 1.25 RM tied "BERLIN SW 16.6.31" to air mail cover endorsed "Par avion au dela de Moscou et en Chine" to Nanking/China, transits "BERLIN C L2 6.6.31" (airport p.o. 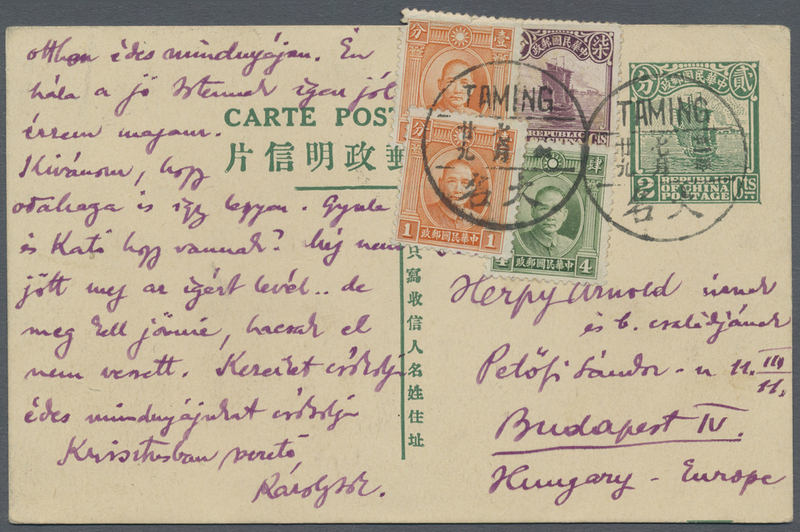 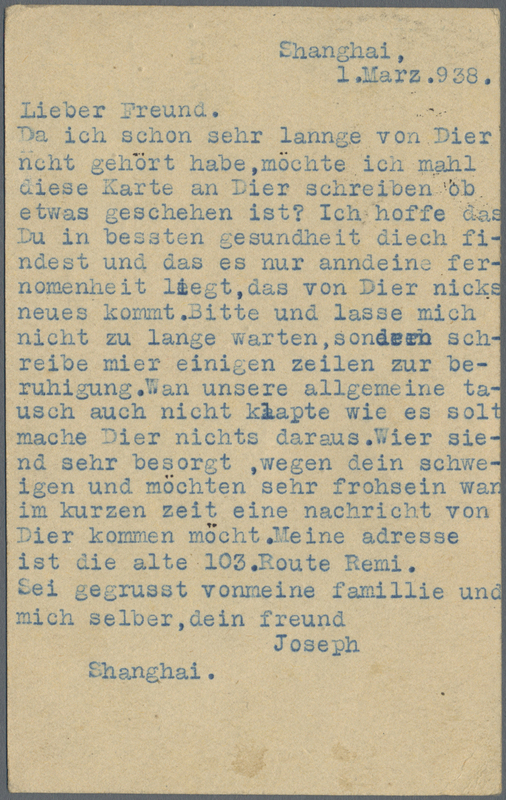 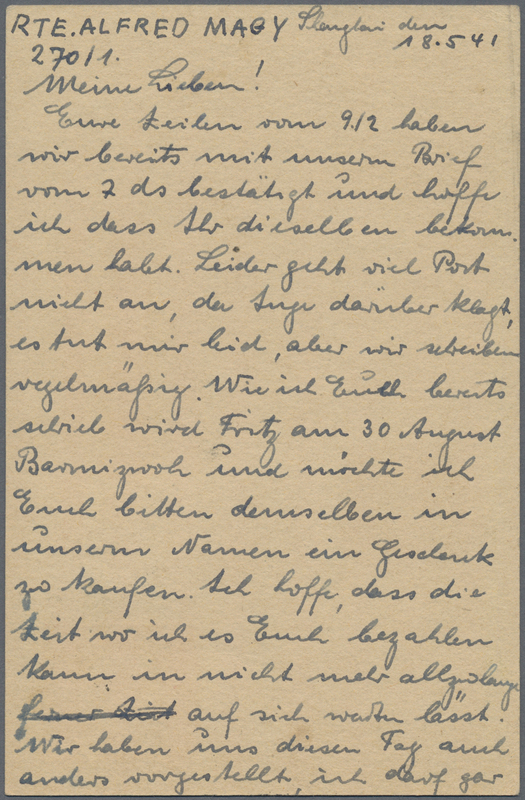 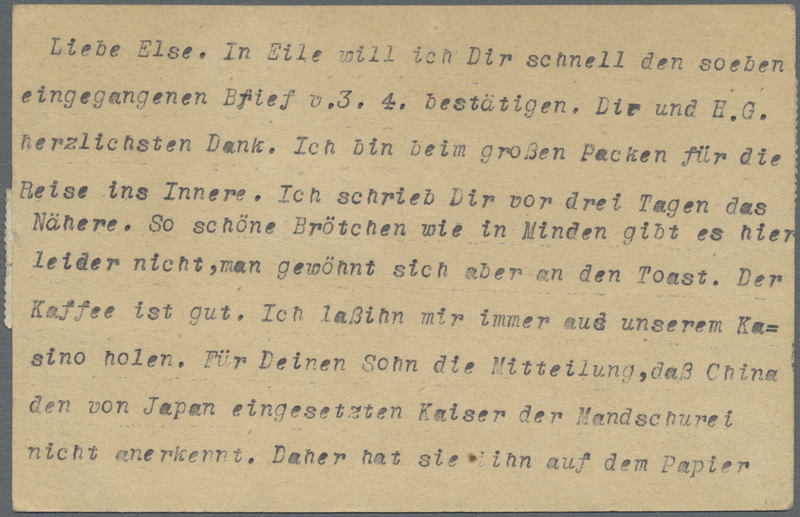 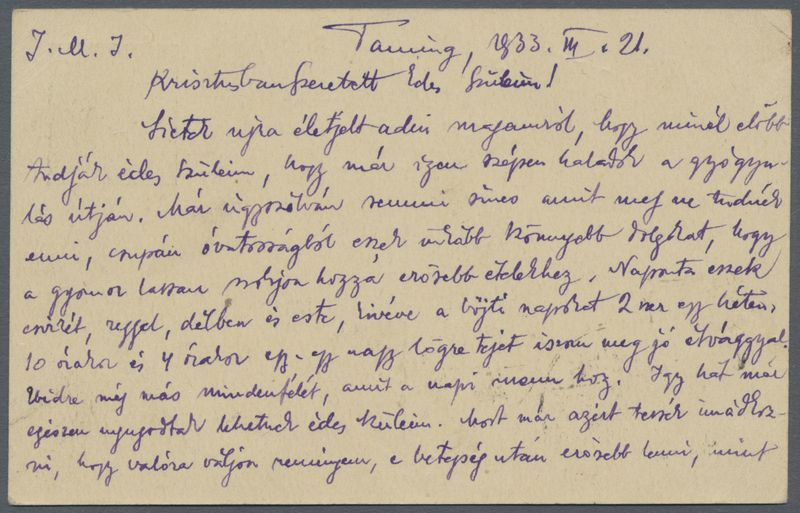 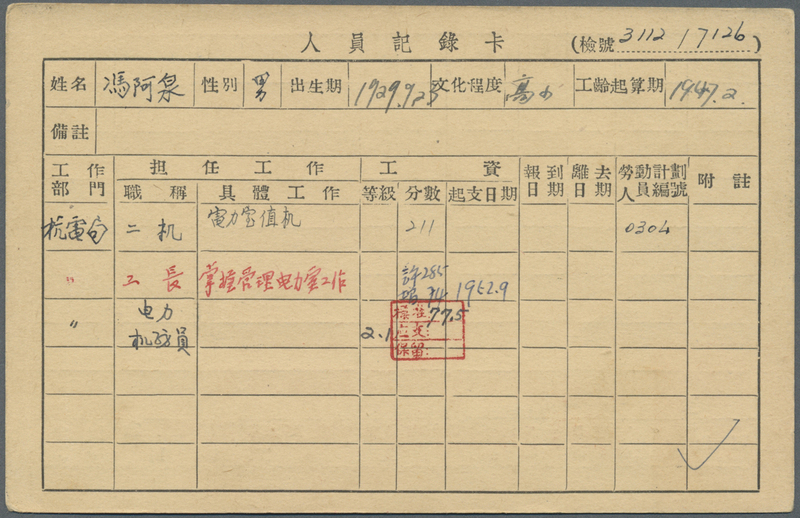 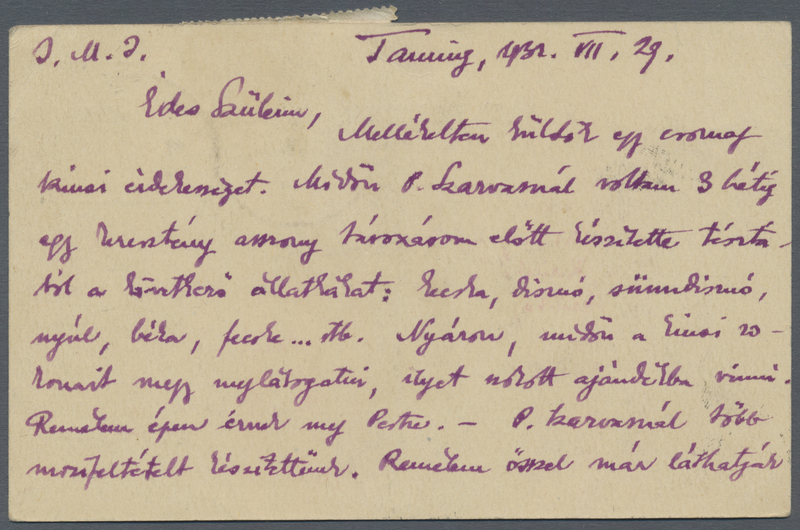 ), "MANCHOULI 25.6.31" and arrivals "NANKING 31.6.29". 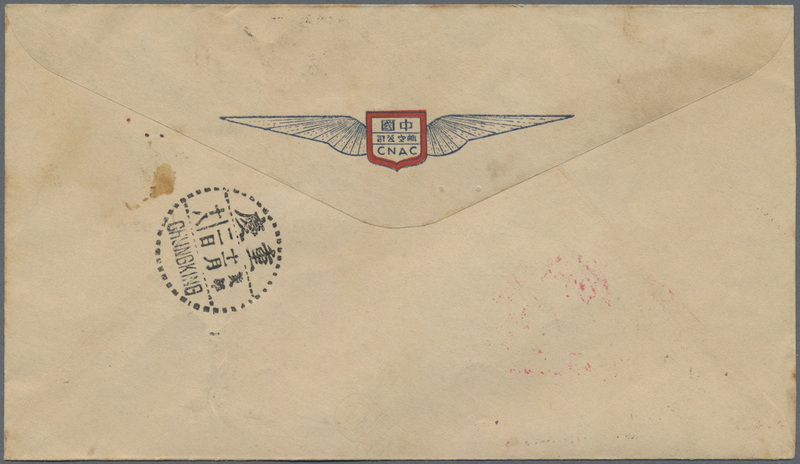 6627 Brief (cover) 1937, "FIRST FLIGHT CHINA CLIPPER / CHINA - U.S.A. / VIA CNAC-HNGKONG / AND U.S. AIR SERVICE", registered cacheted envelope from "SHANGHAI 26.4.37" to New Rochelle/New York/USA with green and blue flight cachet on front and U.S. receivers "SAN FRANCISCO MAY 9 1937" and "NEW ROCHELLE MAY 9 1937" on reverse. 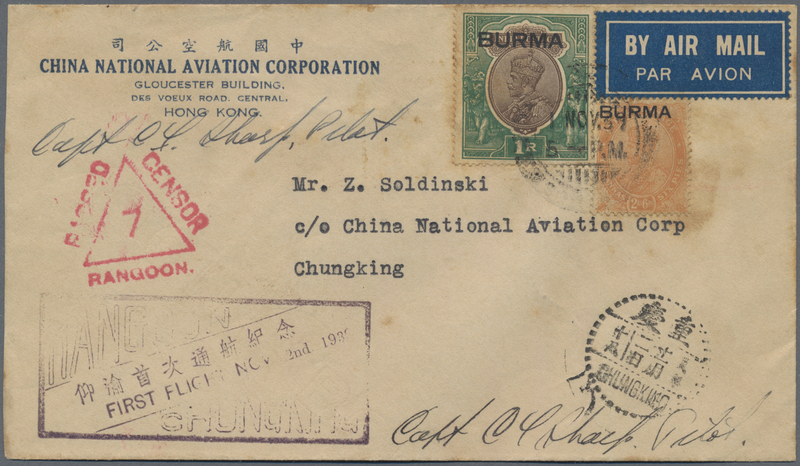 6628 Brief (cover) 1939, First Flight Air Mail envelope headed "First Flight Chinese National Aviation Company / Rangoon - Chungking" addressed to "E. Denison, care American Embassy, Chungking" bearing Burma SG 25, 2A.6P. 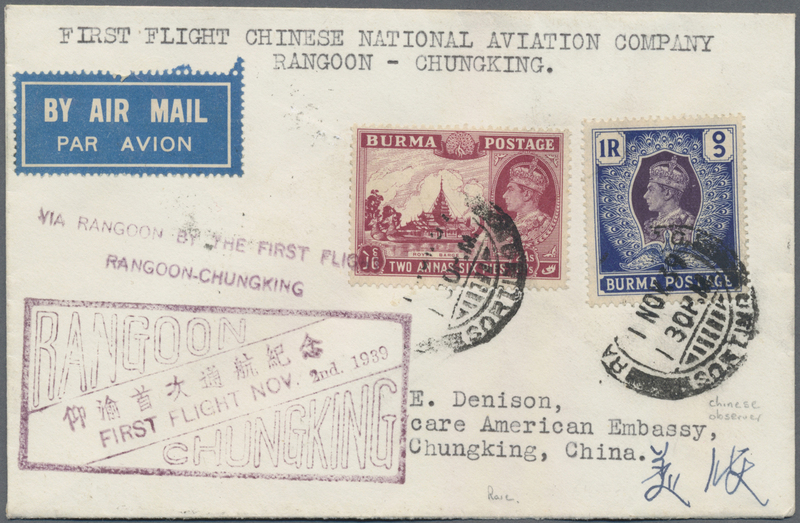 claret and SG 30, 1 R. blue and violet tied by Rangoon / Sorting double ring '1 NOV 39" with framed "RANGOON / CHUNGKING / FIRST FLIGHT NOV. 2nd 1939" on face with hand-stamp "VIA RANGOON BY FIRST FLIGHT / RANGOON-CHUNGKING" with arrival on reverse. 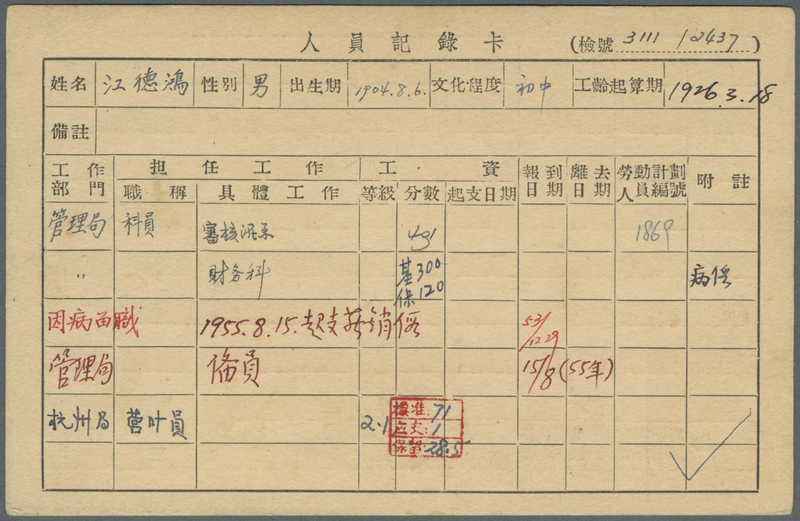 Rare First Flight. 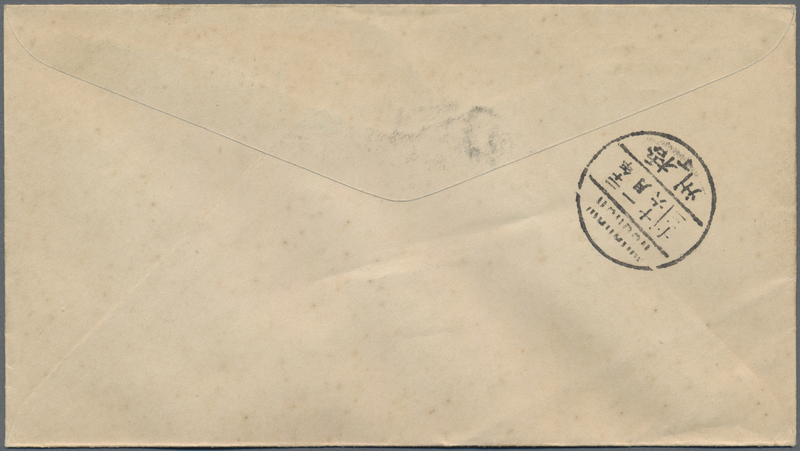 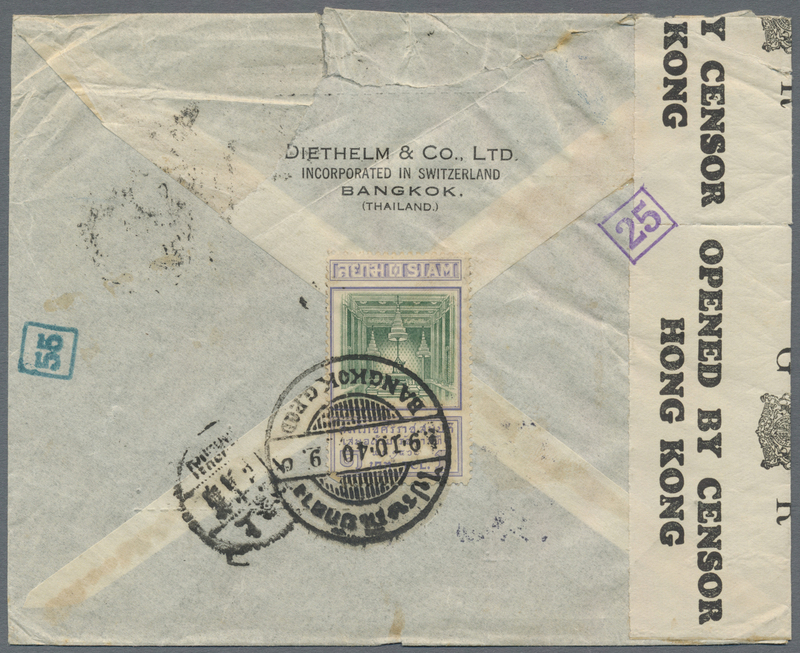 6629 Brief (cover) 1940, incoming air mail from Thailand via Hong Kong: Siam 1 B. on reverse and 15 S. (3) on front tied "BANGKOK G.P.O. 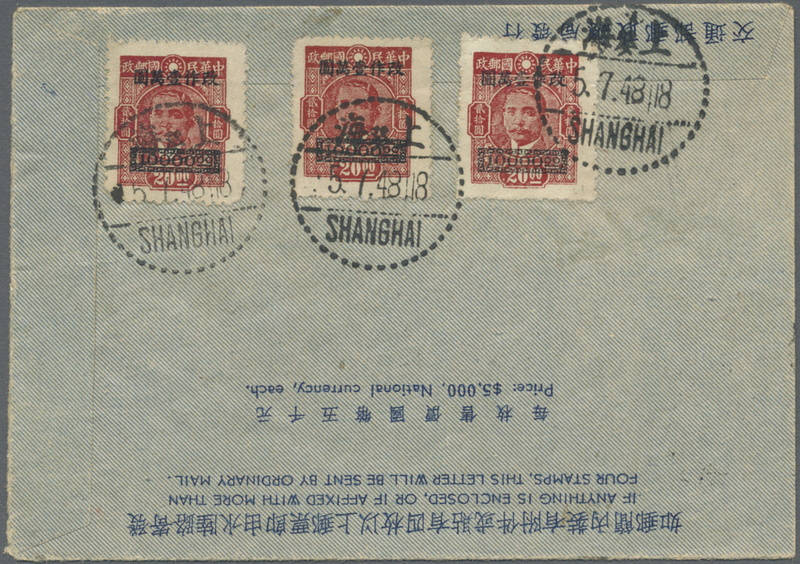 9.10.40" to air mail cover to Shanghai, bluish green "AIR-TRANSIT/3" and boxed "55" of Hong Kong plus censor tape on Diethelm cover w. arrival "SHANGHAI 29.10.20" (Oct. 20, 1940), backflap torn. 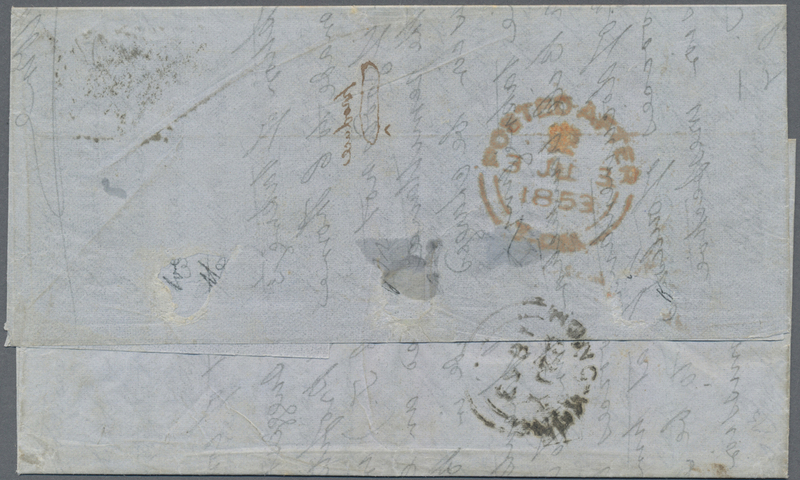 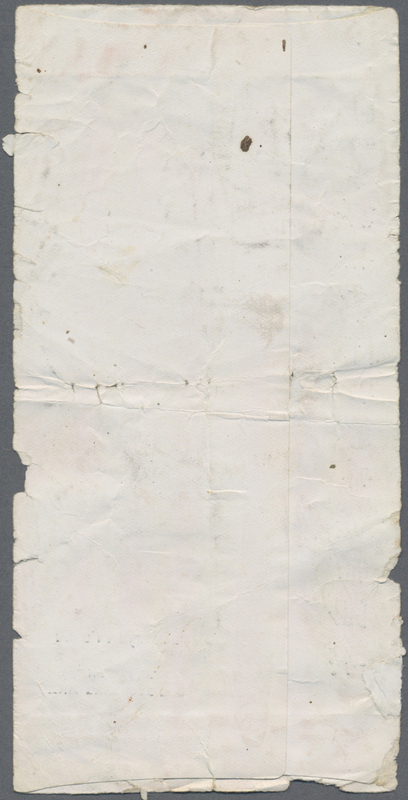 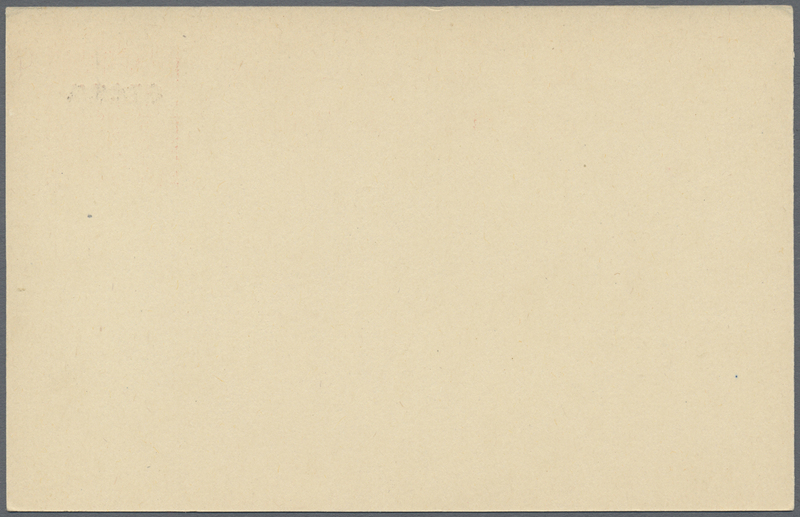 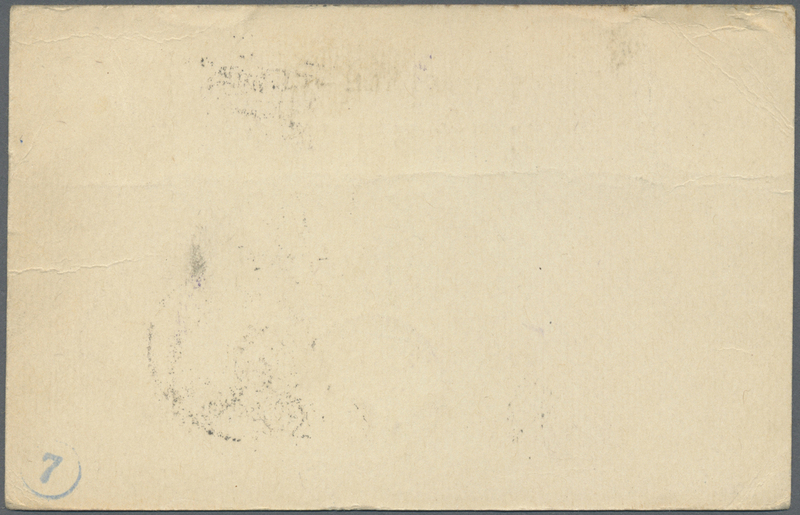 6630 Brief (cover) 1853, England, QV 1 Sh. 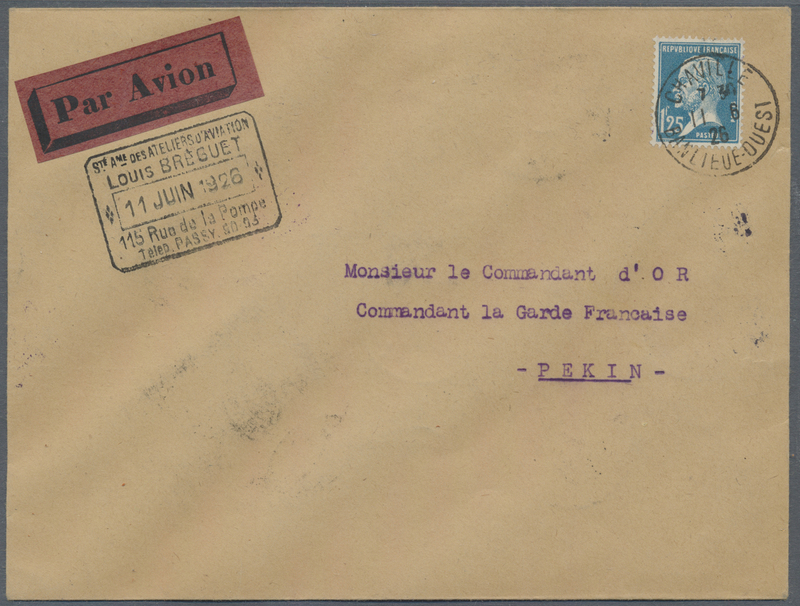 greenoctogonal imperf. 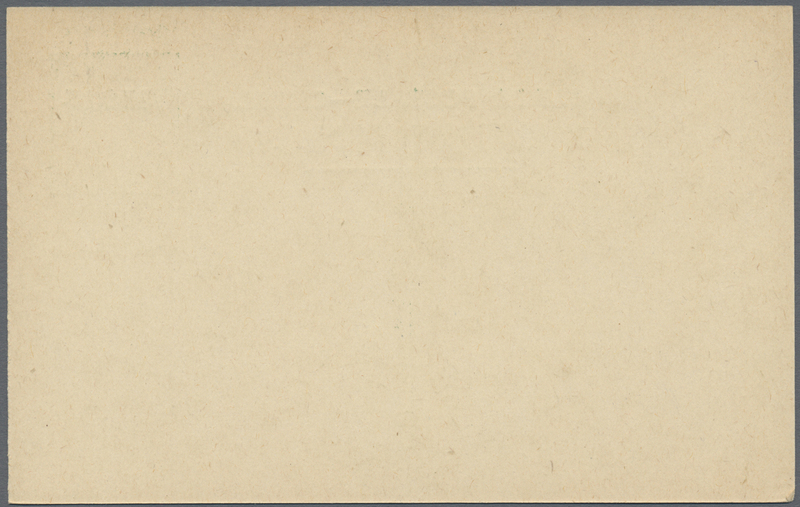 horizontal strip-4 (faults) canc. 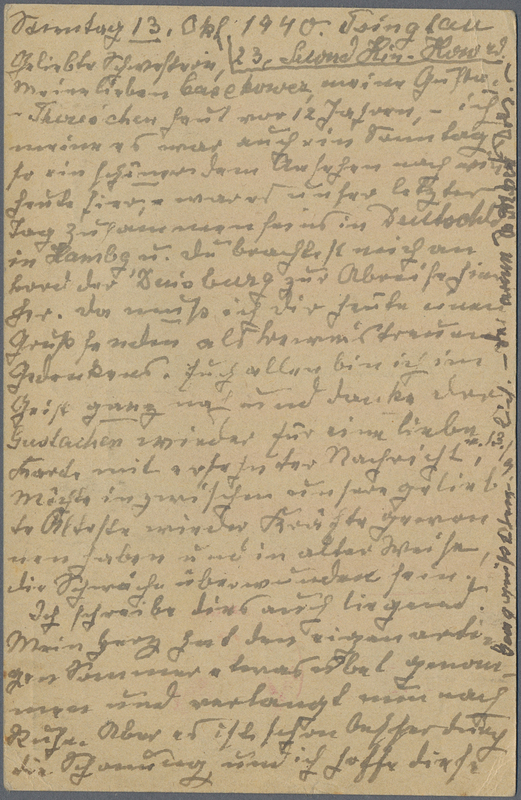 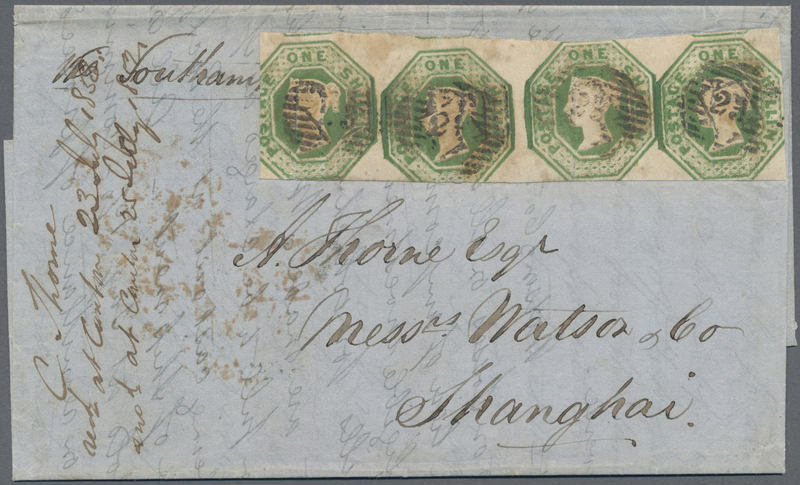 "23" to entire folded letter with "London 3 June 1853" dateline endorsed "via Southampton" to Shanghai/China. 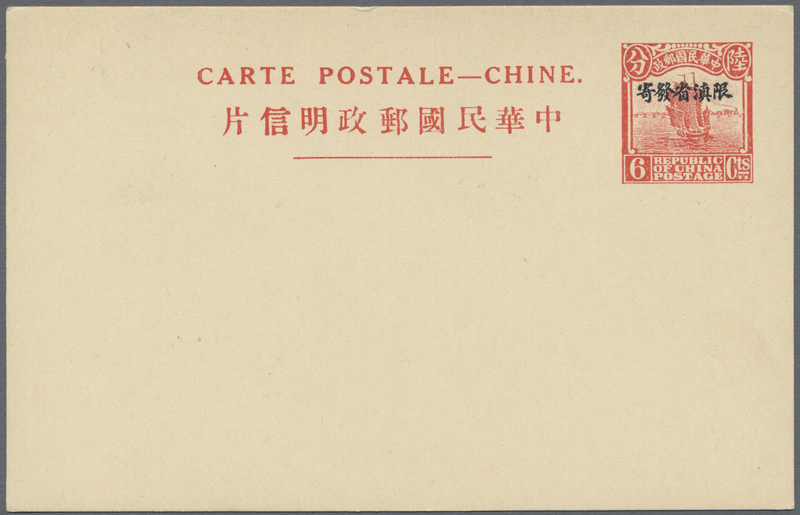 On reverse vermilion "POSTED AFTER TIME 3 JU 1853" and transit "HONG KONG 22 JY 1853" with notes "not at Canton 23 JLY/25 JLY 1853".